One of the most interesting new pistols at SHOT Show 2019 was the SIG Sauer P320 XCompact, the latest in the P320 X-Series. What is most noteworthy about this pistol (and other X-Series guns) is that the TRIGGER GROUP, not the frame, carries the serial number. That means that after you process one SIG P320 X handgun through an FFL, you can put that same trigger group in different frames. So you could have a full-sized pistol for slow-fire target work, plus a compact version for concealed carry. Or you can have a 9mm AND a 40 S&W version of the same pistol. SIG calls this “unprecedented modularity”. We agree — this is very, very clever. Glock, Walther, Ruger — take note! SIG’s P320 XCompact is a modular, striker-fired pistol with a serialized trigger group that makes it adaptable to multiple calibers, size, and grip options. The P320 XCompact is available in 9mm and features X-RAY3 day/night sights, a flat trigger, and night sight rear plate making it optic ready. There are both a striker safety and a disconnect safety. The P320 XCompact comes standard with two, 15-round magazines. At SHOT we tried the P320 XCompact and found it very comfortable in the hand — with ergonomics similar to our much-loved metal-framed P226. SIG says the XCompact has a “completely redesigned grip module with an improved beavertail and fastback profile, contoured magwell, and a deep trigger guard undercut”. “The P320 XCOMPACT redefines what a compact pistol should be by combining concealability with full size XSERIES features. Through extensive end-user feedback, the P320 XCOMPACT provides for smoother handling and optimizes the user experience,” said Tom Taylor, Chief Marketing Officer and Executive Vice President, Commercial Sales. 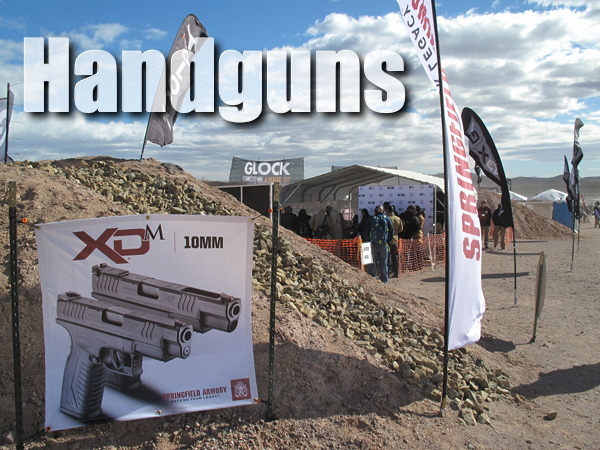 Share the post "SIG Handgun Can Run Multiple Calibers and Frame Sizes"
There are tens of thousands of products on display at SHOT Show, the world’s largest firearms industry trade show. We visited dozens of manufacturers to see their featured items on display. Here are our selections of interesting products as well as some eye-catching product displays. Check out the cutaway Redding dies, the Norma giant plexiglass bullet shell. 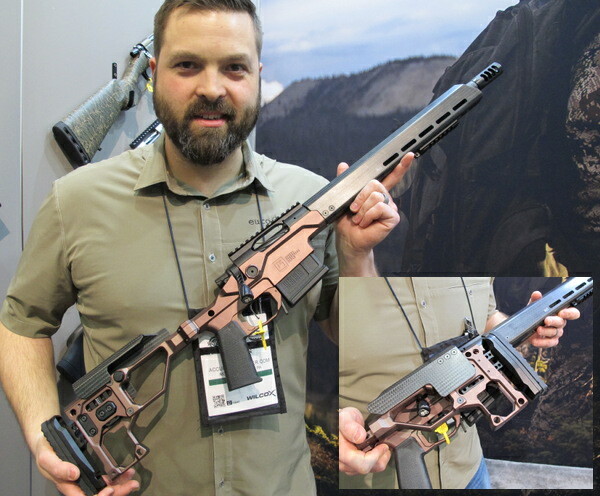 Volquartsen showcased a radical rimfire rifle with “carbon everything”. Designed for rapid-fire Steel Challenge games, this unique rig has a carbon-wrapped barrel, carbon buttstock shaft with an aluminum buttplate, and a carbon fiber handhold forward of the action. The ModShot stock secures the bottom of the action, provides attachment points for rear section and front handhold. Total weight (without optics) is just 3 pounds, 13 ounces! MSRP is $1733.00. Our hunting editor, Colton Reid, said this “bare bones” carbon-enhanced design could be adapted for an ultralight centerfire hunting rifle under 5 pounds. At the Redding booth, we saw interesting sets of “cutaway” sizing dies. It was cool to see the insides of various types of dies. In the photo above the top two dies are micrometer-top dies. Below are three sizing dies: neck-sizing bushing die at left, a “plain” full-length sizing die in the middle, and a bushing full-length sizing die on the right. The bushing FL die would be our first pick — it allows you to size the entire body of the case, while adjusting neck tension (and bullet “grip”) with the neck bushings. 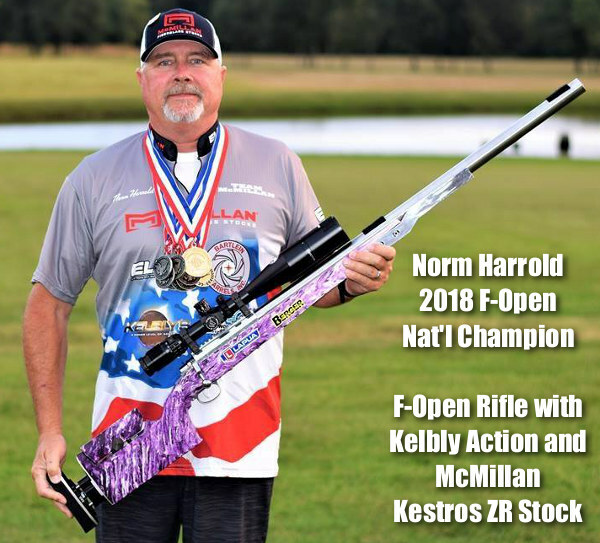 Today, January 24th, Norm Harrold, the current F-Open 2018 national champion and 1000 yard record holder, appears at the McMillan booth. In the video above he’s holding the advanced, long-wheelbase Kestros ZR stock he used to set the new National Record and capture his F-Open title. Norm will explain the features of this stock that make it shoot so well. The Kestros ZR’s low COG and long wheelbase help the stock track and resist torque. Our buddy Jason Baney was mighty impressed with the Modern Precision Rifle from Christensen Arms. With a handsome desert bronze finish, this rifle features carbon-wrapped lightweight barrel, carbon handguard/forearm, and carbon cheek piece. The folding buttstock folds quickly and secures with a magnetic lock. 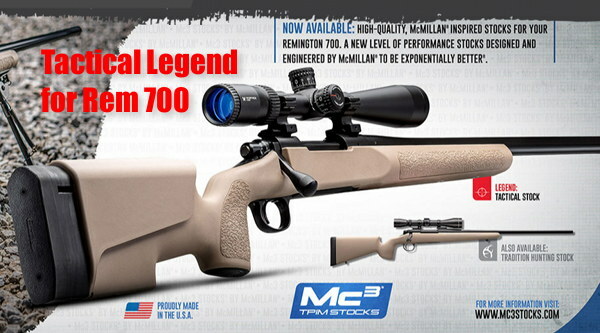 The rifle comes with a sub-MOA accuracy guarantee, and is available in 8 chamberings: .223 Rem, 6.5 Creedmoor, 6.5 PRC, .308 Win, 300 PRC, .300 Win Mag, .300 Norma Mag, and .338 Lapua Mag. Jason was so impressed with this $2295 rifle he said: “this could be my next hunting field rifle”. He said the folding stock really is an advantage when trekking long distances. 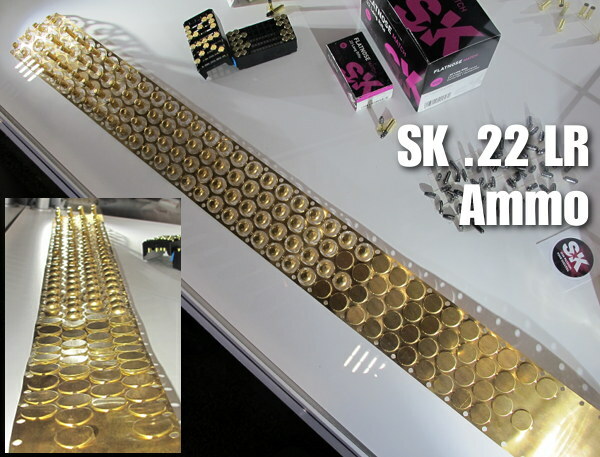 At the Capstone Precision Group booth, we saw a long sheet of shiny brass metal. We were fascinated. This sheet illustrated how SK .22 LR casings are created from brass, started with a dime-sized flat circle, then ending with an extend narrow cylinder. This then becomes the case which receives the priming material (in the rim), powder and bullet. This is not identical to the actual factory production process, but it does show the key stages of rimfire case “punching” and drawing. Rotary tumblers do a fine job cleaning brass with media in liquid solution. There are many large rotary tumblers on the market. But frankly most are bigger than needed by rifle shooters who might just clean 100-200 pieces of brass at a time. 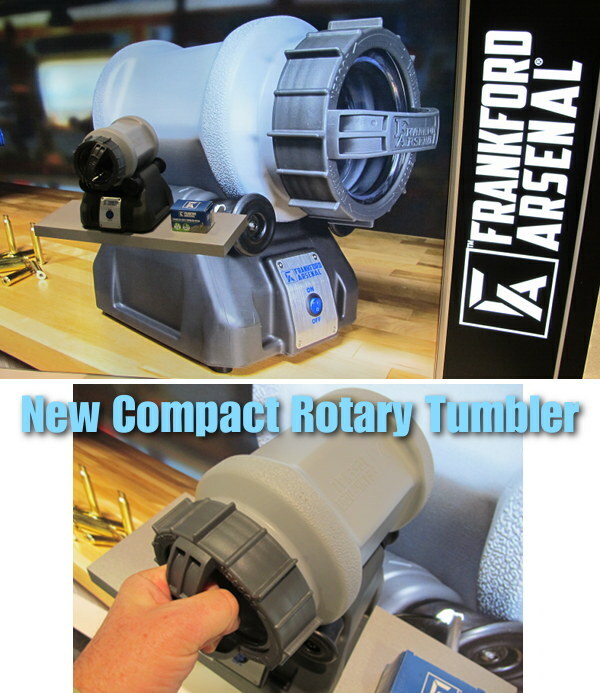 Frankford Arsenal developed a smaller tumbler that runs smaller batches efficiently. Good idea. 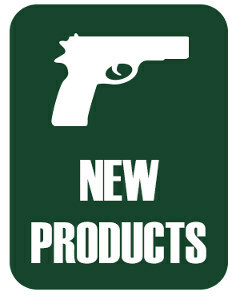 Look for this product at MidwayUSA in a few months. It should be significantly cheaper than Frankford Arsenal’s large, 7-liter Platinum tumbler which sells for $165.00 on Amazon. 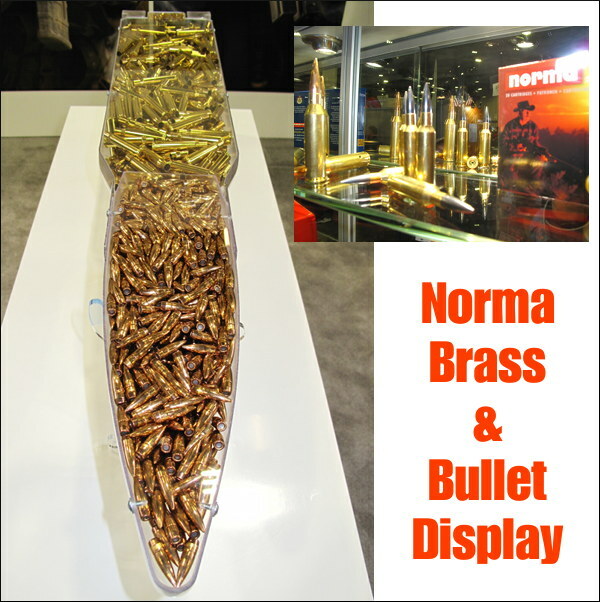 Norma, maker of excellent brass, bullets, and loaded ammunition, had a eye-catching prop for displaying Norma bullets and cartridge brass. Over four feet long, this one-of-a-king plexiglass cartridge half-model held hundreds of projectiles and casings. Eye-catching for sure. 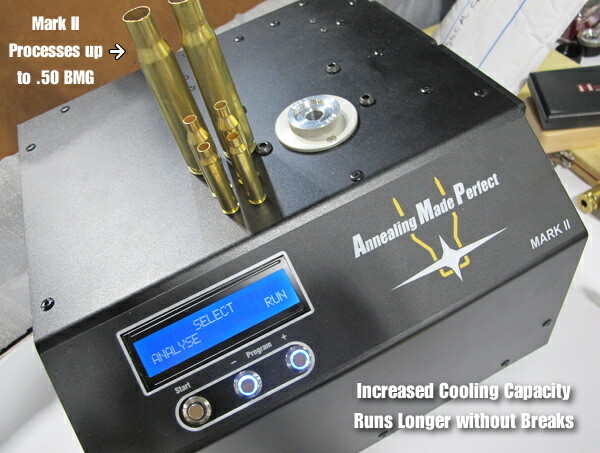 The makers of the Annealing Made Perfect (AMP) electro-induction annealing machine showcased a new, upgraded Mark II model. The new Mark II machine looks similar on the outside, but has a number of enhancements. 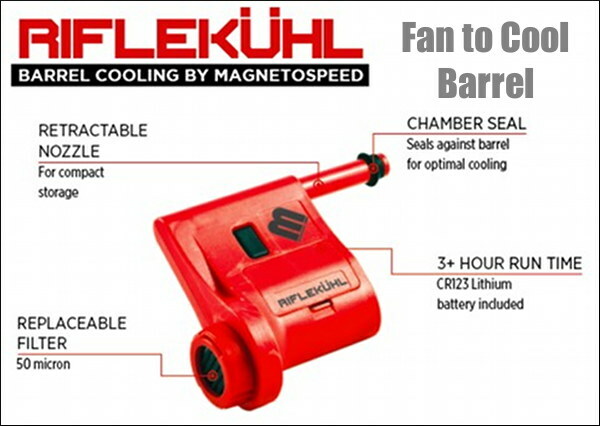 It has bigger strong fans so it ran process more cases before you need to take a break to let the machine cool down. In addition, the Mark II now has a “super-sized” case chamber that can hold virtually any size case — all the way up to the .50 BMG. We watched as the AMP 2 annealed a jumbo .50 BMG in just a few seconds. Very impressive. 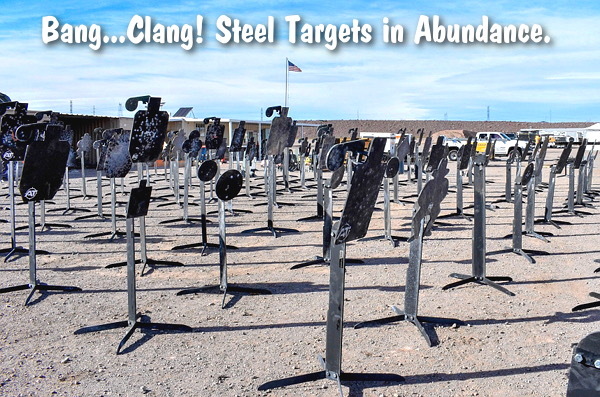 For more info and pricing, visit www.AMPannealing.com. 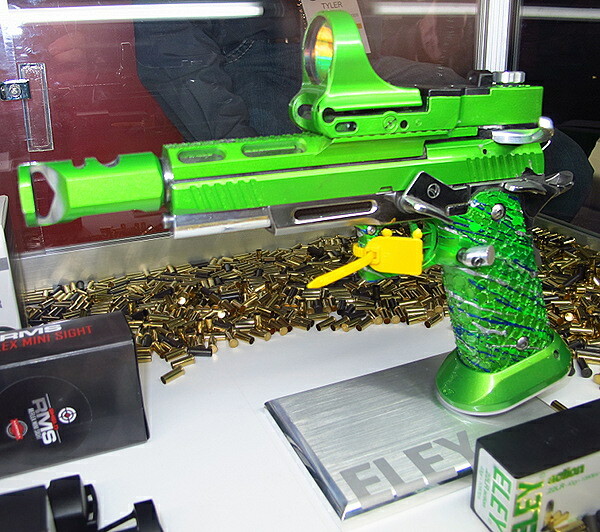 Eley, the UK-based rimfire ammo maker, had a couple wild-looking race guns on display. This Metallic green stunner features a massive compensator, relieved slide (for faster cycling), and a color-coordinated C-MORE Reflex sight on top. Inconspicuous, this pistol is not! 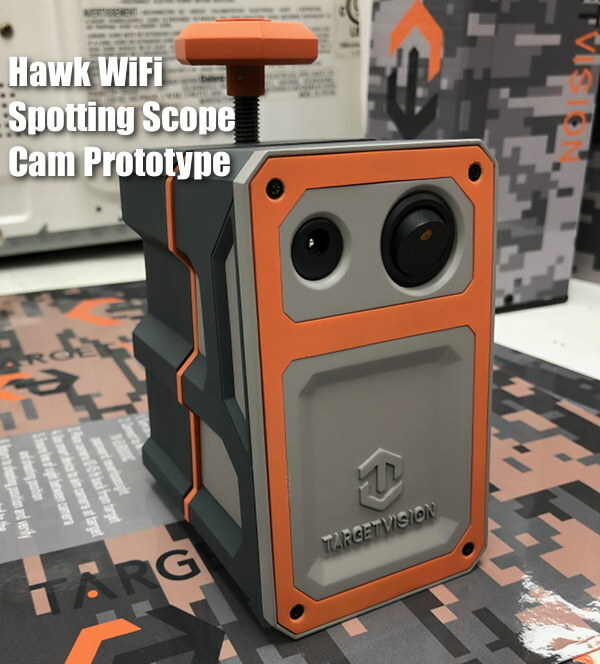 Share the post "SHOT Show 2019 — Eye-Catching Products"
For folks in the gun industry, the third Monday in January is the best day of the year. 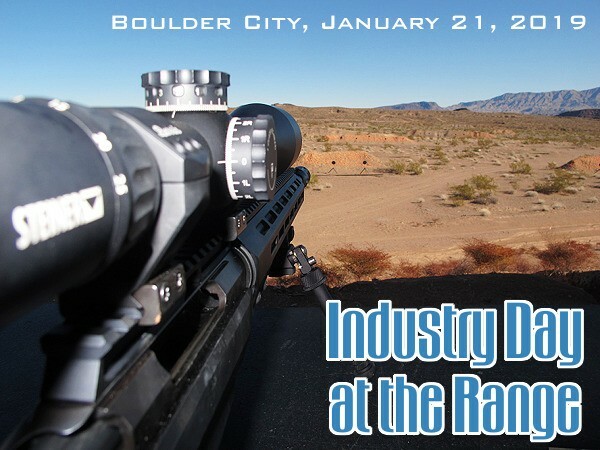 Held in conjunction with SHOT Show, Industry Day at the Range lets us try out dozens of new rifles and pistols, as well as meet top gun designers and friends in the shooting sports. We saw some very great new products this year. 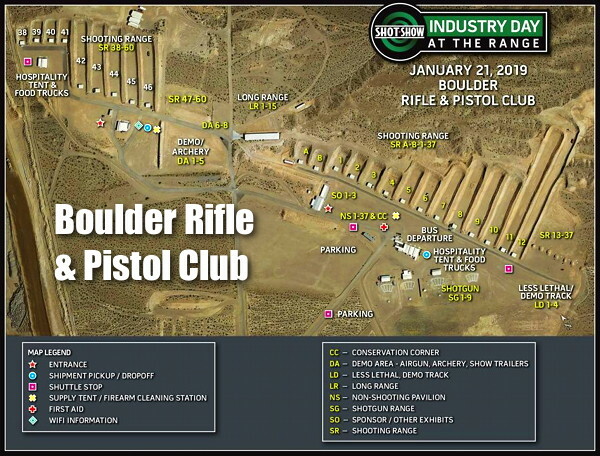 Here are some of the most interesting “take-aways” from Industry Day at the Range, held in Bolder City, Nevada on January 21, 2019. Meeting old friends, and shooting new guns. 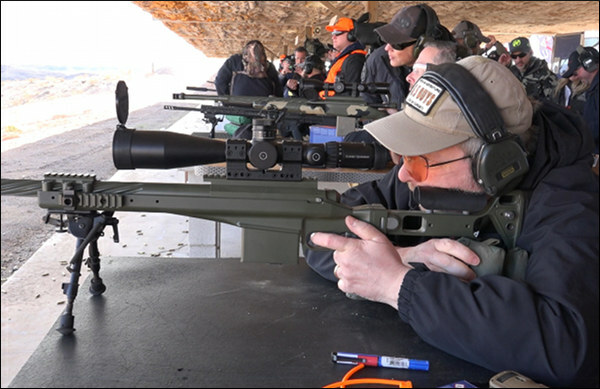 That’s what Monday was all about at the annual Industry Day at the Range, a “hands-on” preview the day before SHOT Show opens in Las Vegas. Your Editor met with old buddy Jason Baney and Hunting Editor Colton Reid at the crack of dawn and headed out to the Boulder City (NV) range. We were not disappointed — there was plenty to see this year. On display were a bunch of new precision rifles, a slew of new handguns, and some very exotic optics (including a turretless digital camera/riflesight). 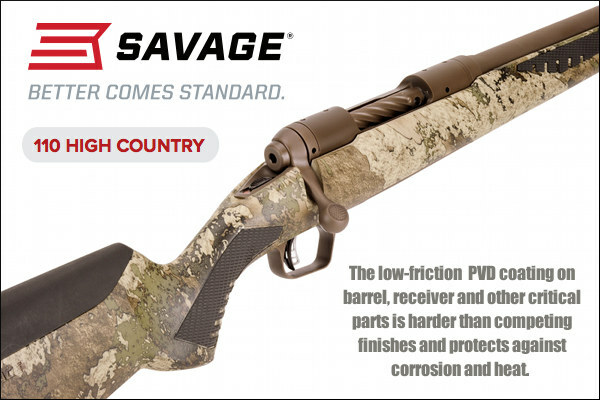 Our friend Stan Pate let us try out Savage’s latest, greatest Modern Sporting Rifle, the MSR 10 Precision. Offered in 6mm Creedmoor, 6.5 Creedmoor, and .308 Win, this quality rig has many distinctive features, including side-charging handle, adjustable gas system, and convertible dual-angle pistol grip. This rifle proved exceptionally accurate on steel out to 400 yards. 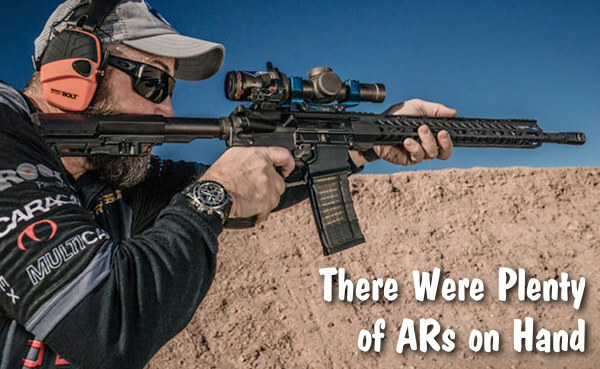 It is certainly one of the best AR10-class rifles we’ve tried. 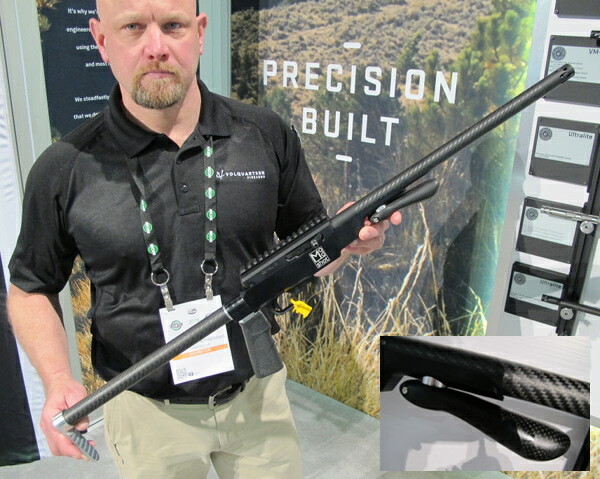 The PGW Defense Timberwolf rifle in .338 Lapua Magnum proved to be a relatively light-recoiling rifle considering the cartridge and overall rifle weight of 14.5 pounds. Even with gusting 7:00 o’clock side winds (with 20+ mph peaks), hitting targets at 1,000 yards was very doable — a reminder of what the .338 Lapua can deliver. Impressive rifle. Oryx (an MDT brand) has introduced a chassis system for Howa, Remington, Tikka, Ruger and Savage actions that retails for $399. While it comes with a grip, the user can bolt on standard AR-15 grips. 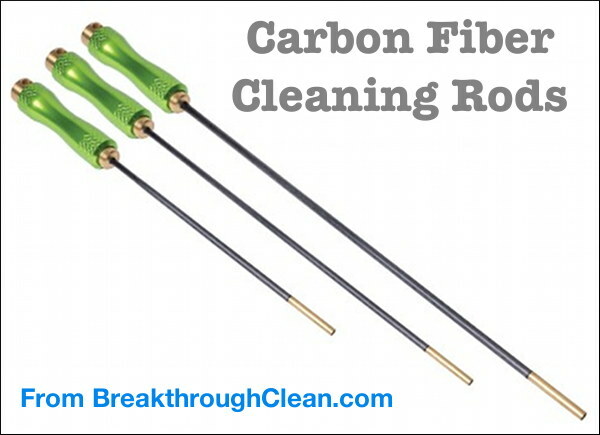 This affordable system comes with an adjustable cheek piece and length of pull. Industry Day file photo courtesy CMG Marketing & Events. Leupold showcased an impressive new scope that should interest F-Class and PRS shooters. 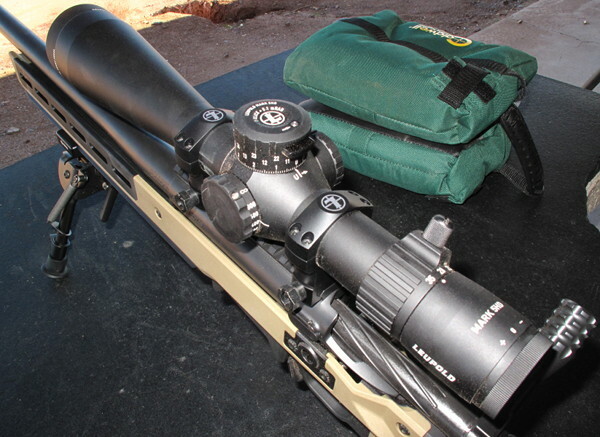 Leupold’s new 7-35x56mm Mark 5HD optic had very good glass, and positive controls. At 33 ounces, it is quite a bit lighter than other scopes in this class. 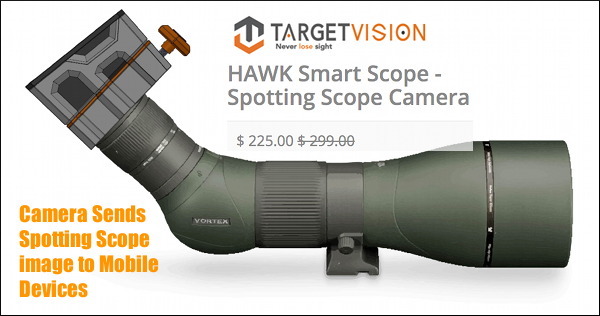 We don’t have exact pricing yet, but it should be much less expensive than a Nightforce ATACR scope with the same magnification range. The new 7-35X Leupold models will be available with either milrad or MOA adjustments and advanced reticles. The milliradian models will be available in six reticle options: H-59, CCH, TMR, Tremor 3, and Tremor 3 Illuminated. The MOA version will be available with an Impact 60 MOA reticle. A big step forward in digital optics is Sensight’s new SSR400 Digital Riflesight, basically a high-resolution digital camera with a microprocessor-controlled reticle. The system is self-contained in a lightweight, compact display that allows the firearm to be held and used as if it held a traditional rifle scope. The digital interface allows users to customize the display, record video, and even livestream the image. 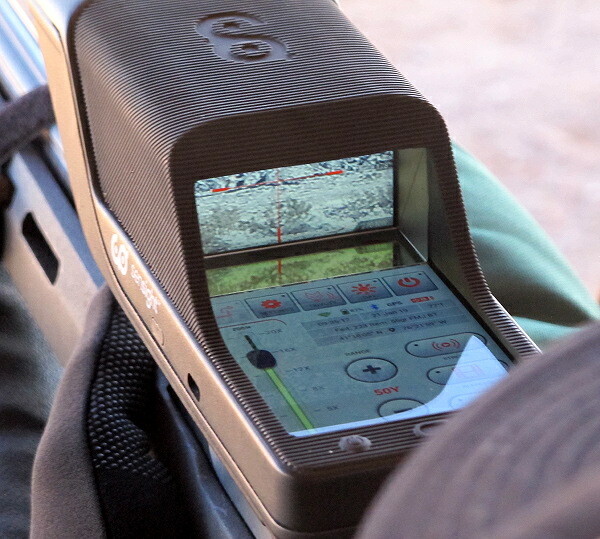 The display eliminates eye relief issues, making it easy to acquire targets at distances up to 400 yards. 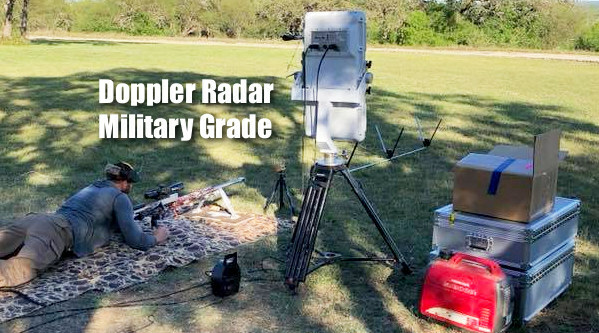 Beyond 400 yards the image becomes noticeably pixelated, but still allowed us to easily hit targets at that distance. The price is moderate. We viewed hundreds of pistols, shot a dozen or so, and came away with four we really liked. Two were suppressed rimfire pistols, and two were centerfire “Race guns”. We had fun trying out the Ruger MARK IV™ 22/45™ LITE fitted with a factory suppressor. Ruger had a new “bling” version on hand for test shooting. This was the Model 43926, with gold anodized aluminum upper receiver. This is ported for lightness — this pistol weighs just 25 ounces (without suppressor). 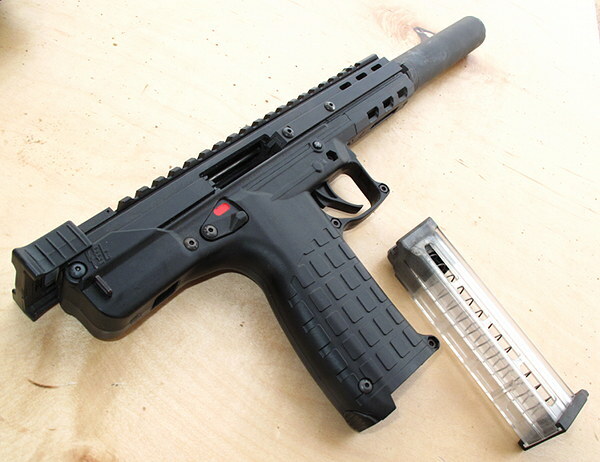 We shot a very impressive KelTec pistol derived from the KelTec CMR-30 .22 WMR carbine. This new CP33 pistol is mostly the same as the CMR-30, but with no stock and a different front section. The 33 in the name refers to the fact that the clear magazine holds 33 rounds of .22 LR ammo. The version we shot was suppressed, and it was a pleasure to shoot. The trigger is excellent — noticeably better than most other 22s on the market. With virtually no recoil, it was ultra-quiet and surprisingly accurate. 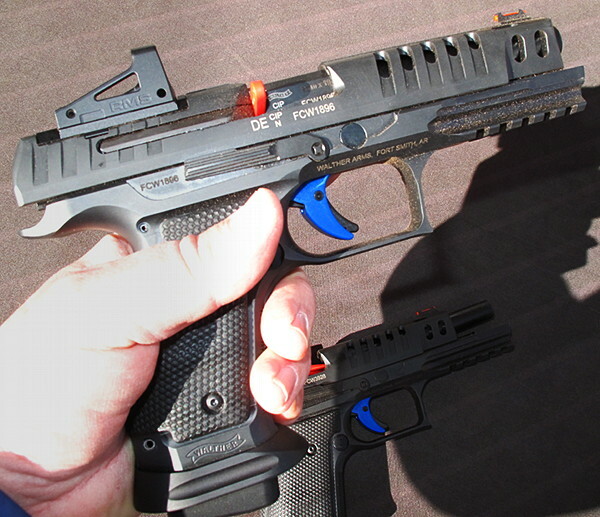 This Editor was surprised that a KelTec was one of his favorite new handguns at Industry Day. KelTec says the first production run should start shipping in March, 2019. Walther’s PPQ Q5 has been popular with action pistol competitors. Now Walther offers an enhanced SF (“Steel Frame”) version. We like how the pistol balances with the heavier, beefier steel frame. We expect the extra mass of the steel frame will also reduce muzzle flip and perceived recoil. This is available from Walther with iron sights or a Red Dot. Israel’s Bul Armory offers a wide range of defensive handguns and target pistols, including the SAS series of competition pistols. 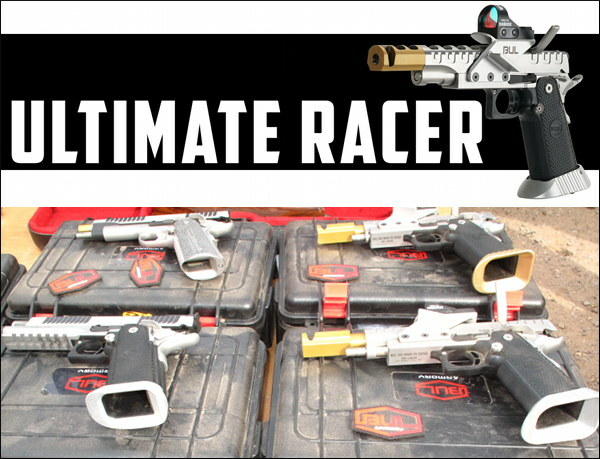 These impressive “Race Guns” feature compensators, relieved slides, flared magwells, and excellent match triggers. Needless to say these comp pistols are a hoot to shot — with superfast cycle rates for fast shot transitions. 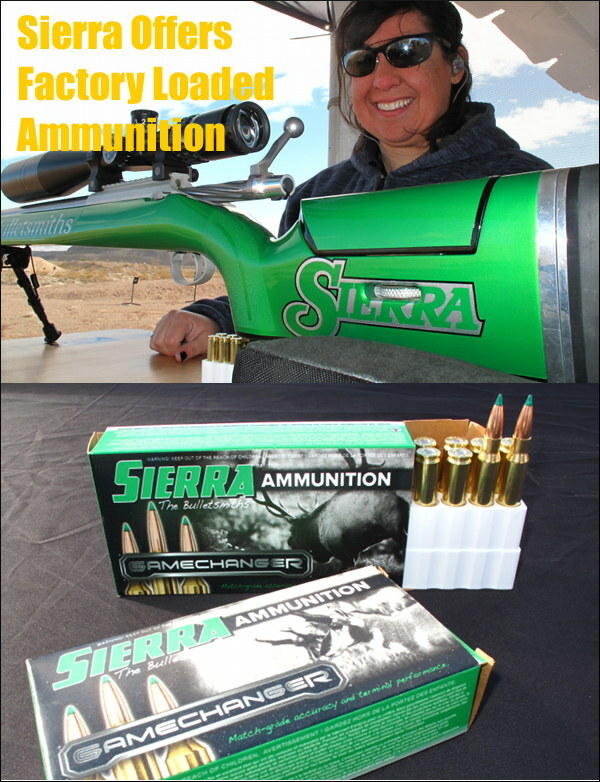 The big news in the world of commercial ammunitions come from Sierra bullets. For the first time, Sierra will be offering Sierra-branded loaded ammo. Our good friend (and multi-time Nat’l Long Range Champion) Michelle Gallagher revealed that Sierra will offer a selection of high-quality factory ammunition in 2019. Sierra will be releasing its own brand of hunting ammunition. Sierra “Gamechanger” will debut in five popular hunting calibers: .243 Win, 6mm Creedmoor, 6.5 Creedmoor, .270 Win, and .308 Win. The rounds use a new tipped GameKing bullet for match grade accuracy in a hunting round. No details yet on brass, primer, and powder components for this ammo, but if the quality of the bullets is any indication these rounds will serve hunters well. Norma unveiled some impressive new pistol ammunition. The new MHP (Monolithic Hollow Point) offers extreme expansion with major energy transfer. 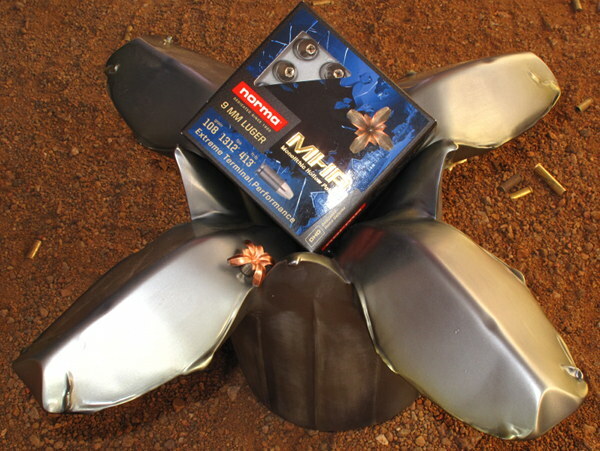 This MHP bullet features a lead-free solid core. This new MHP ammo offers serious performance for regions where lead-core bullets are prohibited. Accuracy is also very good with these new Norma bullets. We saw some impressive gear for game hunters and varminters. 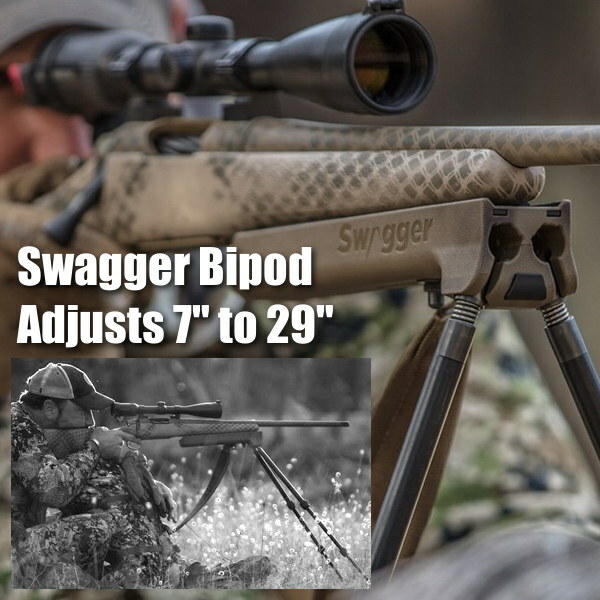 Swagger bipods has introduced a new kind of rifle support that combines the best qualities of both a field bipod and shooting sticks. And we saw a nice swivel field bench that offered very good stability. 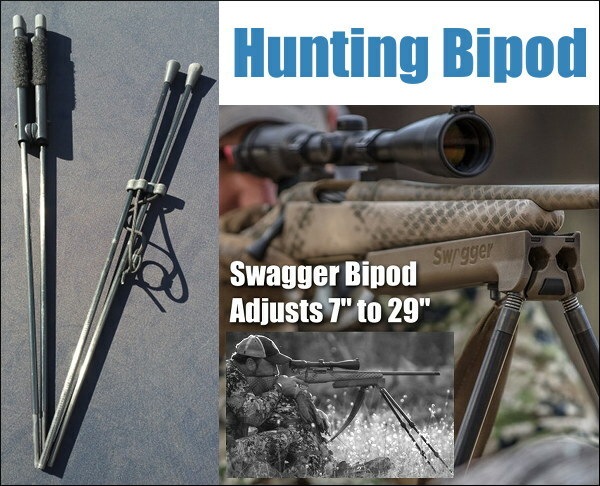 Swagger demonstrated its new Stalker QD42 (quick detach) and Stalker Lite bipods. The QD42 is a lighter, more compact design of the already-established hunter series that allows for fast attach and removal via the push of a button. The quick attach/detach is a great feature that allows hunters to carry the bipod in their pack until it’s time to shoot. 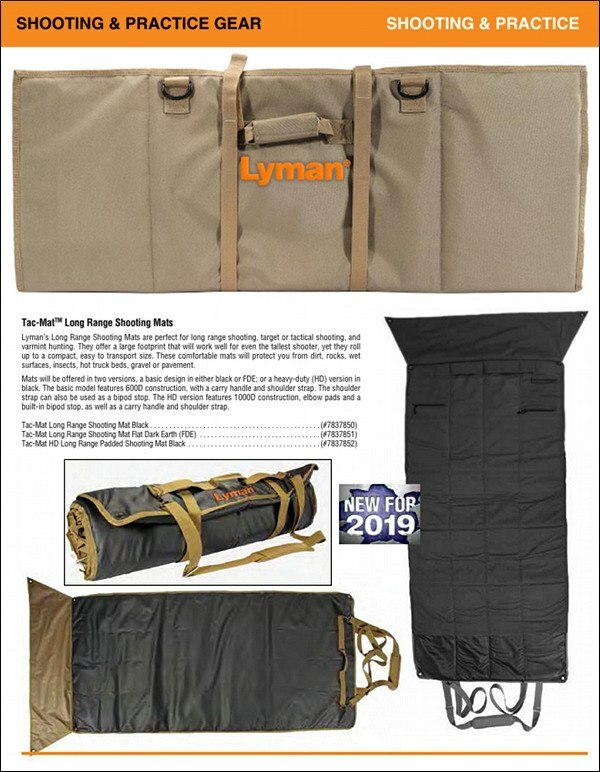 The Stalker Lite offers similar advantages in that it is extremely light and folds up like tent poles so it can be carried in a pack or side pocket. Both systems demonstrate the maneuverability swagger is known for and are reasonably priced. Many Industry Day exhibitors were using the well-made and versatile DOA Shooting Bench. 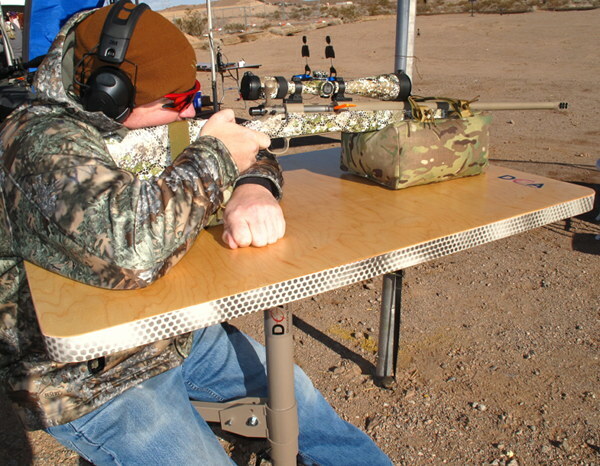 These benches feature a strong steel base supporting a very stable top that rotates to change rifle aim points in seconds. In addition, the DOA bench features a swivel seat. We liked the build quality on these DOA benches. Varmint hunters would like this bench — it would work well in a prairie dog field. Next best thing to being there — this 5-minute video, produced last year, shows Industry Day highlights. It’s a great overview featuring a wide variety of rifles, pistols and shotguns. 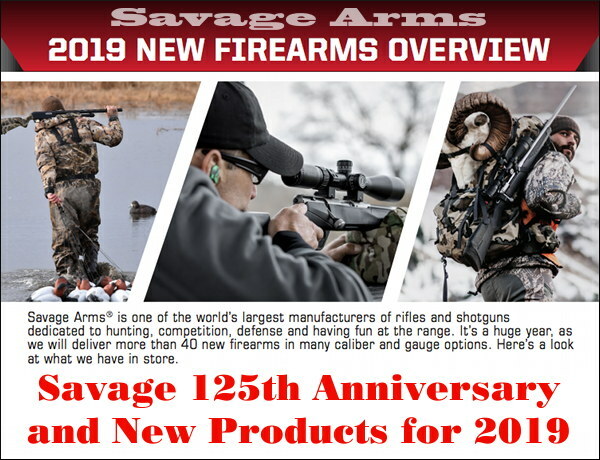 The biggest commercial, hands-on “live fire” gun demonstration in the world, Industry Day at the Range is attended by over 1700 journalists and buyers. 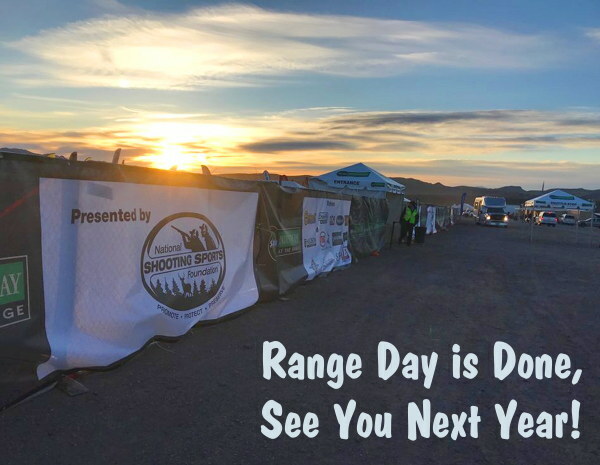 Share the post "Industry Day at the Range 2019 — Highlights"
There’s a formidable new option for PRS Production Class. 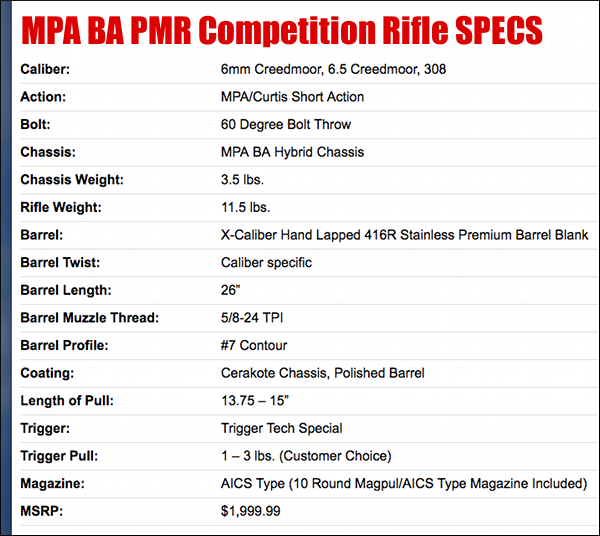 MasterPiece Arms (MPA) is bringing out a new tactical/practicalcompetition rig, officially called the MPA BA PMR Competition Rifle. This new rifle has a $1999.99 price tag, making it suitable for Production Class. 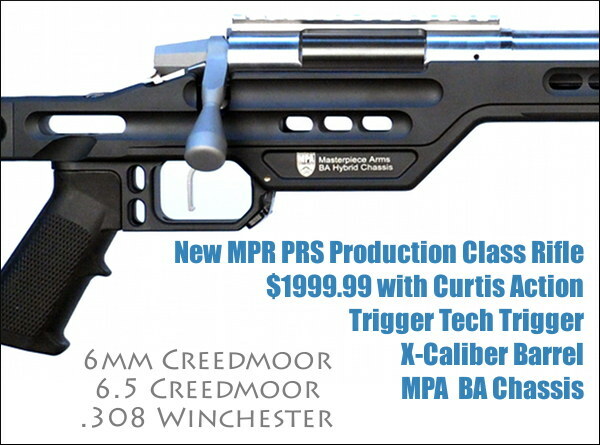 It will be offered with Curtis Action fitted to an X-Caliber, hand-lapped 26″ match barrel. 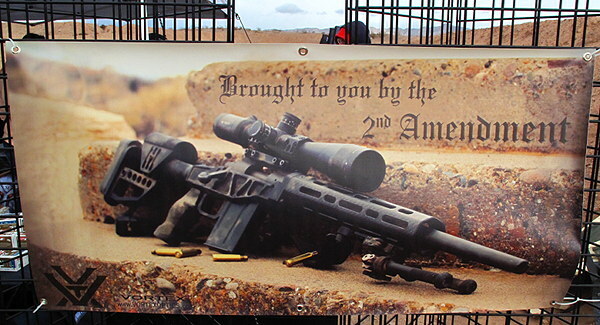 Three chamberings will be available: 6mm Creedmoor, 6.5 Creedmoor and .308 Winchester. This rifle is designed specifically for the Production Class requirements of the Precision Rifle Series (PRS) and has been approved for use within this division. It includes many competition-related features while staying under the $2,000 price limit for this class. It is available in either a Black or Tungsten Cerakote® finish. Accuracy is helped with a very good barrel — an X-Caliber, hand-lapped 416R Stainless premium barrel with a polished finish. The chamber is indicated within 0.0001” or less to the bore of the rifle. The MPA BA PMR Competition Rifle utilizes the MPA BA Ultra Lite Chassis, CNC-machined from 6061 aluminum. The V-bedding system provides additional clearance for glass bedding action and straight section of the barrel. The chassis also includes a built-in inclinometer, thumb notch, lower mounted Picatinny Rail, 20 MOA Scope Rail, A2 Style Pistol Grip and is R.A.T. System compatible. The MPA Buttstock comes with an adjustable cheek riser and length of pull that are locked in position with a series of set screws that are embedded into the buttstock body. This is the same system MPA uses on its Standard BA Chassis, but without the thumb wheels. 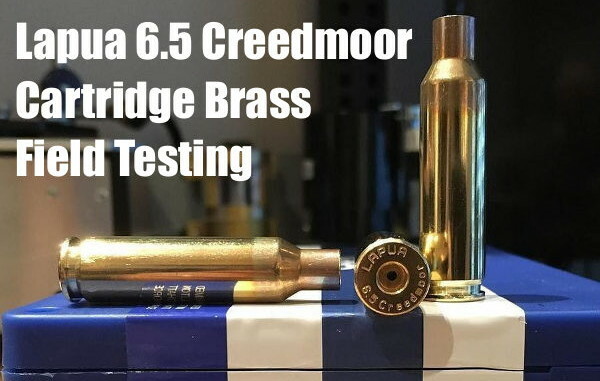 Share the post "New PRS Production Class Rifle from MasterPiece Arms"
PRS and NRL shooters, as well as game hunters, now have new ultra-accurate Berger and Lapua factory ammo for the popular 6mm Creedmoor and 6.5 Creedmoor chamberings. For shooters who do not have the time or equipment to hand-load, these new factory ammo options promise outstanding performance. We fully expect that these new offerings from Berger and Lapua will set new standards for accuracy and ballistic uniformity among commercial ammunition for the 6mm Creedmoor and 6.5 Creedmoor. Lapua’s match ammo for the similar 6.5×47 Lapua cartridge has shown outstanding accuracy with ES/SD numbers rivaling high-quality hand-loads. (SEE 6.5x47L Test Results). Lapua has added the popular 6.5 Creedmoor cartridge to its line of Scenar-L Target ammo and its Naturalis Hunting ammunition offerings. The 6.5m Creedmoor 136 grain Scenar-L offers a high ballistic coefficient (BC) for long-range competitive target shooting, yet maintains SAAMI configuration for flawless function through all factory or custom rifle magazines. Lapua ammo will also be loaded with the excellent 123 grain OTM Scenar. One of our favorite bullets, the 123-grainer offers faster velocities (and less recoil) than its bigger brother, and may be the best choice for many PRS stages. 6.5 Creedmoor ammo loaded with the 140 grain Lapua Naturalis provides hunters a lead-free option for hunting in areas that ban lead bullets. Designed and manufactured from pure copper, Naturalis bullets will reliably retain 90-100% of their original weight. Lapua’s Naturalis projectiles produce consistent, controlled expansion at the widest velocity range on the market. New 6mm Creedmoor Target Ammunition is loaded with Berger 105 grain Hybrid Target bullets, the “go-to” for PRS shooters and long-range accuracy enthusiasts alike. 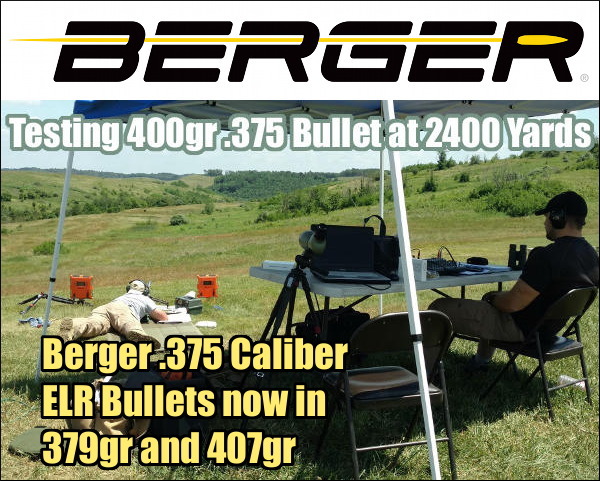 Built using premium-grade Lapua cartridge cases, Berger’s 6mm Creedmoor Target Ammunition provides the discriminating shooter the highest quality components and sub-MOA accuracy “off-the-shelf”, unequaled by the competition. New Berger 6mm Creedmoor Hunting Ammunition is loaded with 95 grain Hybrid Classic Hunter bullets in premium Lapua brass. These top-flight components deliver lethal precision and sub-MOA accuracy — impressive for hunting ammo. The hybrid ogive design of the Classic Hunter projectile is the same as Berger Hybrid Target bullets, while allowing for SAAMI length configurations for efficiency in the field and reliable functioning through magazines. 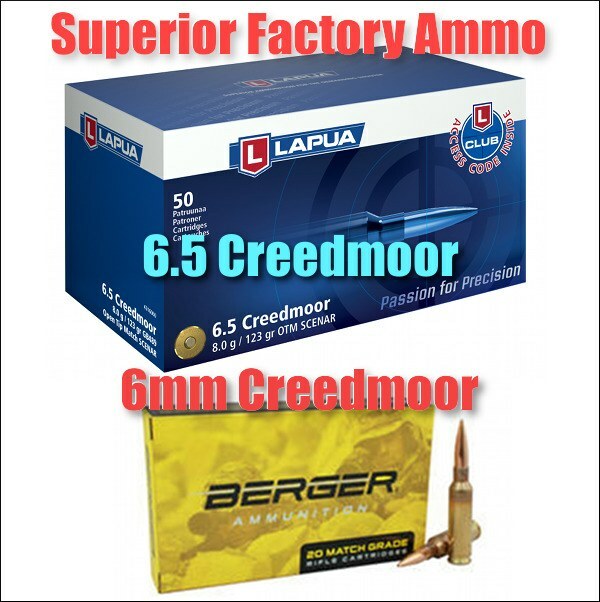 Share the post "Creedmoor Heaven — New Factory Ammo from Berger and Lapua"
K&M offers two versions, one with a single spindle (tool driver) running 50-200 rpm, and another modular design that can have up to six (6) spindles, running from 50 to 533 rpm. This Ferrari of case prep centers costs $2395.00 with all six spindles, with lesser prices for fewer spindles (e.g. $1795 with three spindles). 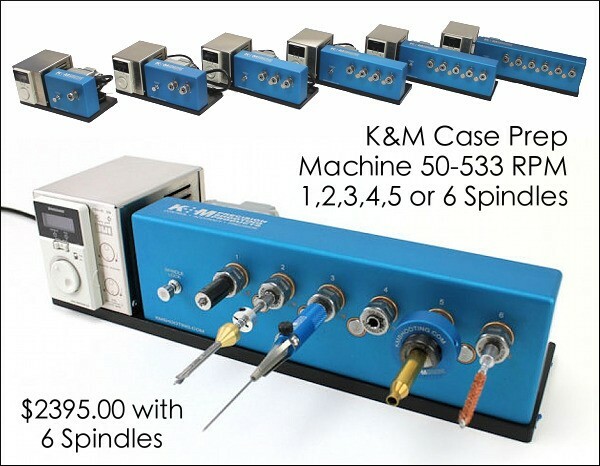 The basic 50-200 rpm one-spindle machine costs $695.00. That’s still a pretty sizable investment. But for some guys, price is no object. Watch Video to see six-spindle machine in action. Being able to adjust the speed within a broad rpm range really is a big deal. You can go slow when needed, then instantly bump up the rpm when you need to do other tasks at a higher rate. Cutting vs. brushing work best at different speeds. 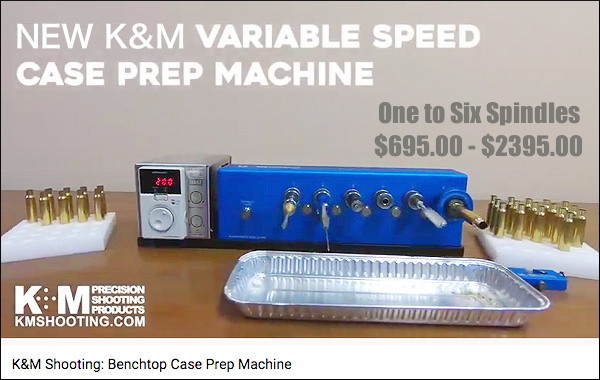 The K&M Benchtop Case Prep Machine is an industrial-grade unit that features an industrial DC brushless motor for constant torque control over a speed range from 50 to 533 rpm (or 50-200 rpm for basic model). The speed can be quickly changed by simply rotating the dial switch and pressing to enter the speed. Watch the video to see the speed control in action. Models are available from one- to six-spindle configurations. The driven spindles feature a unique collet design that accepts ¼” hex shank tools that are oriented horizontally for natural ergonomics. Collet and idler spindles ride on oil-impregnated bronze bearings for smooth operation. You can use K&M-made tools or drive other types of tools using a ¼” hex tool shank adapter with either 8-32 or 3/8-24 threads. 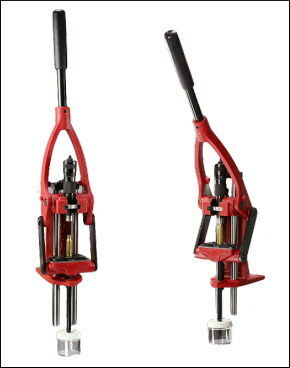 Each model has a spring-loaded spindle lock pin to hold the spindle position while setting tools or loading/unloading cartridges into the power adapter. 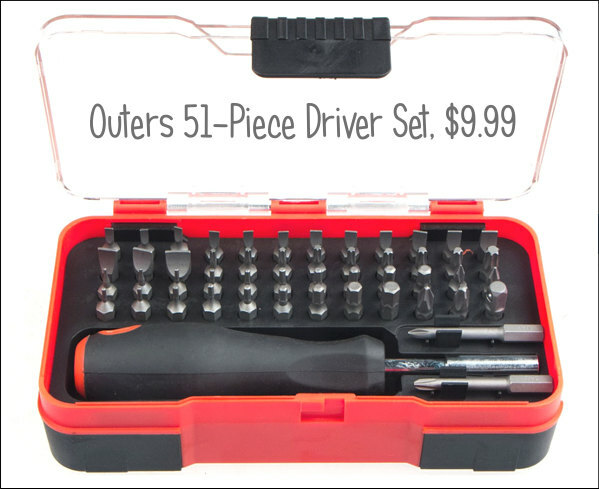 All machines come with quality hard case with foam, chip pan, chip brush, 1/4” hex drive adapter for 8-32 and 1/4” hex drive adapter for 3/8-24. 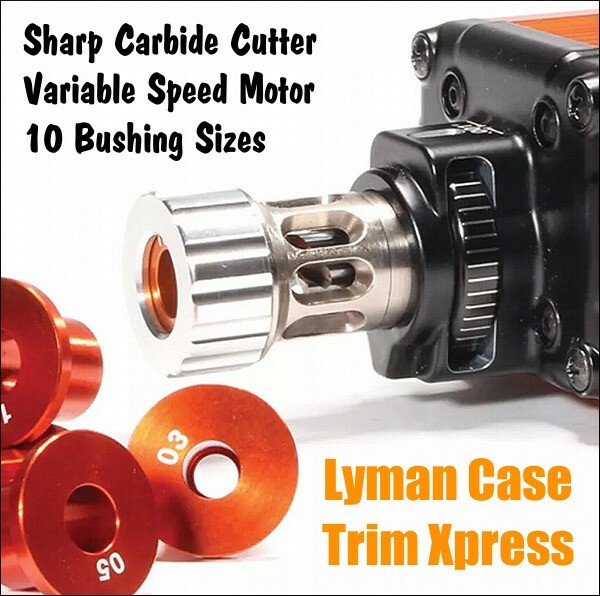 * Lyman will soon introduce the Case Trim Xpress a single-head case trimmer with speed control for the trimmer head. 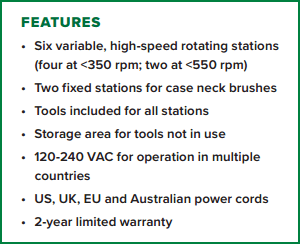 RCBS offers a 6-station Case Prep Center, with variable speeds, controlled by a rheostat. Four of the six heads run up to 350 rpm, while the two high-speed heads run up to 550 rpm. 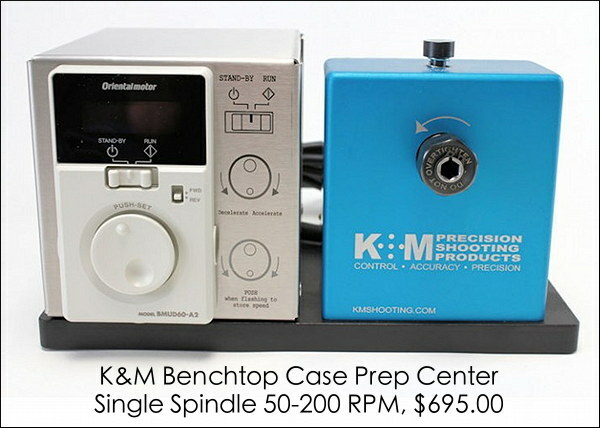 Share the post "K&M Offers New Variable Speed Case Prep Center"
If you’ve ever attended one of the major CMP games, you’ve probably seen Dennis DeMille, former General Manager of Creedmoor Sports. 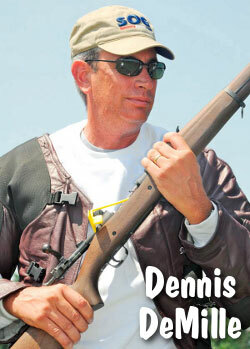 A two-time National Rifle Champion, Dennis helped teach High Power Clinics and he has shared his marksmanship knowledge in many ways. Now Dennis is undertaking a fresh challenge — as the new General Manager of Virginia-based Tactical Walls, a leader in specialized USA-made gun storage/concealment systems. As the Tactical Walls GM, Dennis will oversee operations and new product development. Dennis brings with him more than 20 years of active duty Marine Corps service and nearly 14 years of experience managing Creedmoor Sports. 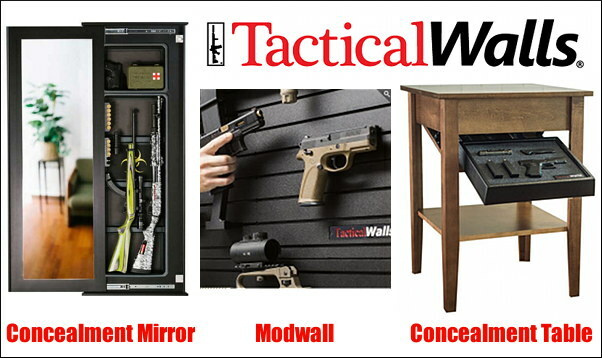 Dennis is pleased to be working with Tactical Walls: “Tactical Walls was the pioneer in concealing firearms in plain sight. Working with people who are passionate about what they produce, who possess that level of creativity, and at a company with limitless manufacturing ability, makes me very excited about the future of Tactical Walls. It’s a real honor and my sincere privilege to now be part of this team. Please feel free to contact me directly at dennis [at] tacticalwalls.com”. Tim Matter, founder and President of Tactical Walls states: “Dennis’ manufacturing and operations experience will help [extend] the tremendous growth and product development we experienced in 2018. We are proud and excited to have him on our team. Stop by and visit us at our booth at SHOT Show later this month or check us out at www.tacticalwalls.com”. 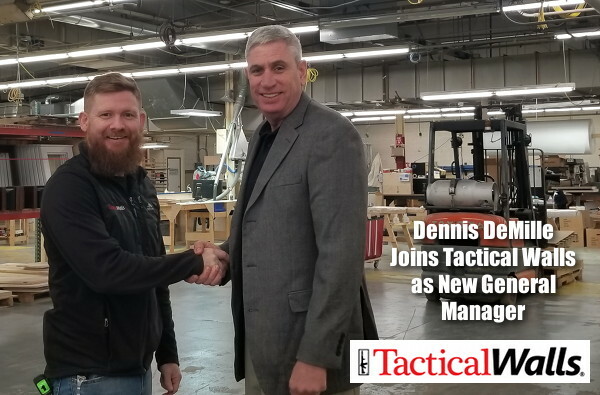 Share the post "Dennis DeMille Becomes General Manager at Tactical Walls"
Mossberg has reached a major milestone. 2019 marks the 100th year in business for this leading USA gun-maker. The Mossberg story began in 1919 with a dream to manufacture durable and reliable firearms that the working class could afford. As simple as that dream was, it was fairly ambitious. After all, Oscar Frederick Mossberg, a Swedish immigrant, was 53 years old. But he was talented and determined. So armed with experience, and keen knowledge of the industry, he and his two sons, Harold and Iver, began O.F. 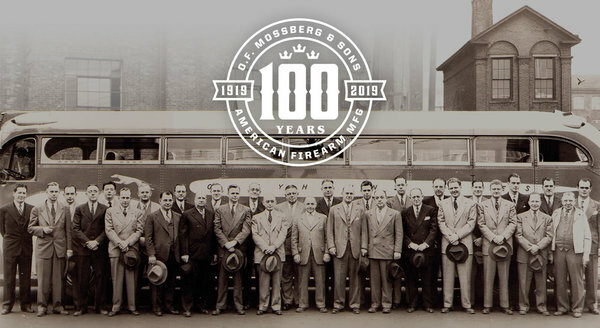 Mossberg & Sons, Inc. A lot has happened in Mossberg’s first 100 years. Yet through it all, the company has proudly remained family owned and operated. Oscar knew the gun industry from being a product engineer at various New England companies including Iver Johnson Arms & Cycle Works, J. Stevens Arms & Tool Co., and Marlin-Rockwell. In 1919, when Marlin-Rockwell went out of business, O.F. Mossberg and his two sons, Iver and Harold, started a new firearms company of their own, O.F. Mossberg & Sons. 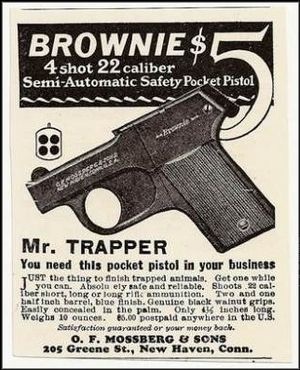 The company’s first gun was the Brownie, a four-shot, 22-caliber pistol that was durable and reliable. This pocket pistol cemented Mossberg’s reputation as a manufacturer of firearms that performed well, and were built to last. Mossberg grew quickly, adding over two dozen firearms while developing and improving bolt-action rifles and shotguns. As it developed new models, the company launched a variety of innovations, including the first range-finding telescopic sight. Oscar Mossberg passed away in 1937. However, his sons continued their father’s legacy. And in 1941, they started manufacturing training rifles for the U.S. military. That contract established a strong connection with the U.S. armed forces. In 1961 Mossberg introduced the Model 500 pump-action shotgun. It proved to be the company’s most successful firearm, reaching the 10 million mark faster than any other, making it one of the world’s most-produced firearms. 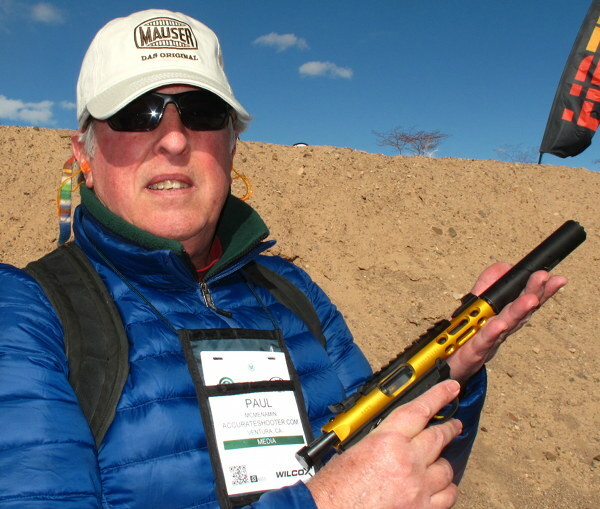 The Mossberg 500 is still one of the most popular shotguns in the world. Mossberg’s innovations continued through the 1970s and ’80s. The 500 led the way to Mossberg’s military 500, 590, and 590A1, the only pump-action shotguns ever to meet all U.S. Military MIL-SPEC 3443 requirements. In 1988, Mossberg introduced the powerful 835 Ulti-Mag pump-action shotgun, the first-ever firearm chambered for 3.5″ shells. Another Mossberg innovation was the MVP, the first bolt-action rifle to reliably feed from standard AR/M14 magazines. Mossberg also developed the innovative Model 590M shotgun, which added a double-stack detachable magazine to the battle-proven 590 shotgun platform. 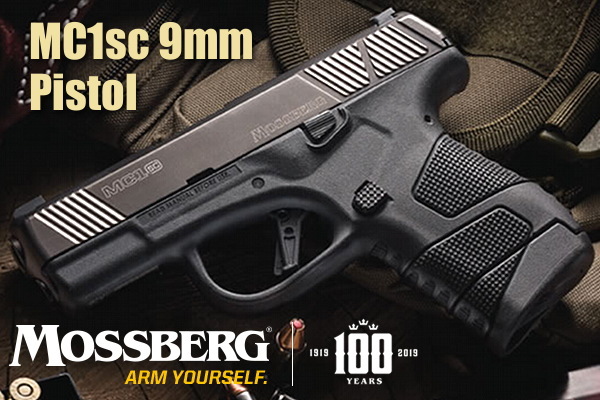 For 2019, Mossberg is introducing the all-new MC1sc, a slim 9mm single-stack compact designed to compete with the Glock 43, Ruger American Compact, and Taurus PT111 G2. The innovative MC1sc was designed to outperform industry-leading 9mm subcompacts while continuing the Mossberg tradition of durability and dependability. Similar in size and shape to the Taurus PT111 G2, this new Mossberg pistol follows a familiar formula: soft-edged polymer frame, single-stack 6-rd magazine (with 7-rd extended option), drift adjustable sights, and an Glock-type trigger-shoe-insert safety. The barrel is 3.4″ while the MC1sc is 1.03″ thick and 6.25″ long (nearly identical to a Glock 43). The backstrap profile and grip angle is sort of a blend between a Glock and the Walther PPS. Why choose the mini-Mossie when so many other proven 9mm carry guns are available? Well, it will definitely cost less than a Glock 43. MSRP for the Mossberg is $421.00 but we expect “street price” to be about $380.00, making the MC1sc $90 cheaper than the Glock 43, which retails for around $470.00 (with standard sights). The MC1sc also has two interesting (and innovative) design features: 1) see-through magazines; and 2) quick-removable striker assembly. 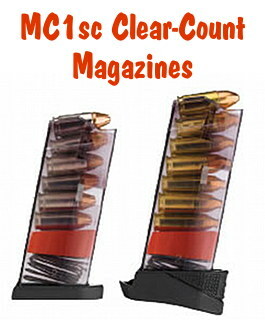 Mossberg ships the gun with see-through Clear-Count™ magazines made from a transparent polymer. This lets you quickly see the number of rounds remaining in your mags. Smart idea. That’s a good thing. Plus, this pistol will also take Glock-compatible mags, so you have a choice. Credit EdLongRange for Mossberg Anniversary Link. Share the post "Mossberg Celebrates 100 Years in Business"
What was old is new again — metal pistol frames. Walther, which has focused on polymer-framed pistols in recent decades, has come out with a metal-framed version of its flagship Q5 model, chambered in 9x19mm (9mm Luger). 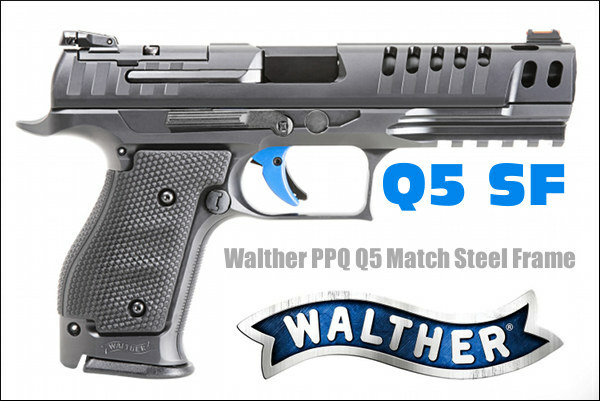 We like this pistol, official called the Walther PPQ Q5 Match Steel Frame (SF). The metal frame adds mass to the gun, and lowers the center of gravity. That reduces muzzle flip somewhat, as you can see in the comparison video below. Ergonomics are very good, reports early tester Graham Baates, who tested the “optics ready” Q5 SF pistol with red dot sights. The Q5 Match SF features an optics ready slide that comes with a Trijicon RMR, Leupold Delta Point, and Docter Optics compatible mounting plate in addition to the standard competition iron sights. 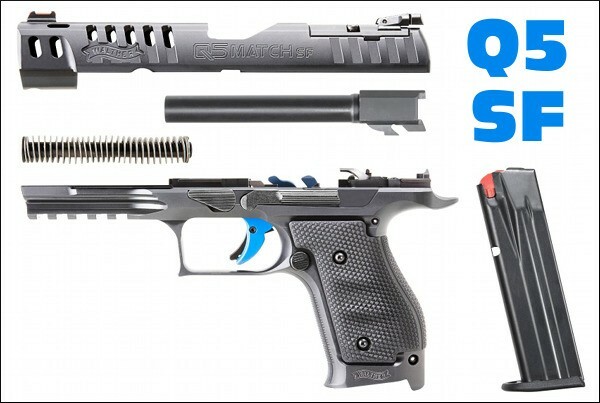 Along with a ported slide and the Carl Walther signature ergonomics, and a blue quick defense trigger, the Q5 SF is the flattest shooting model to date. Share the post "New Steel-Frame Walther PPQ Q5 Match SF Pistol"
Hand-loaders have never had so many great choices in single-stage presses, with many different configurations and features. There are classic O-Frame presses, Coax-style presses, Open-front presses, Pyramid presses, and compact C-Frame presses. 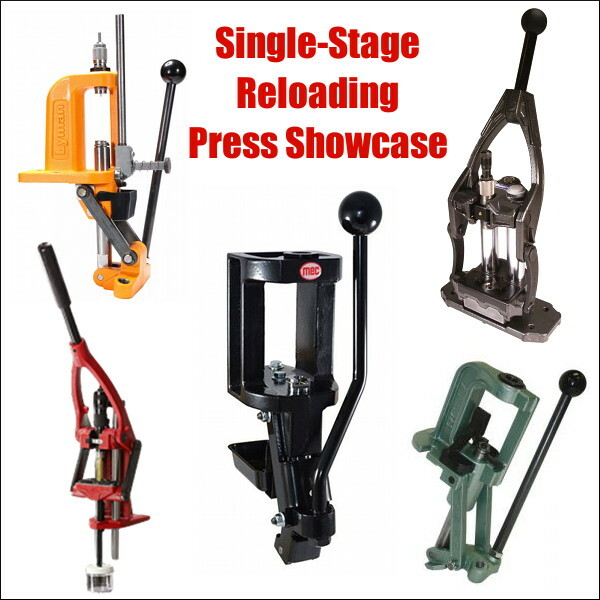 Here is our 2019 Single Stage Press Showcase with products from Forster, Frankford Arsenal, Hornady, Lee, Lyman, MEC, and RCBS. We’ve included short videos showing the features of these reloading presses. If you are shopping for a new press you should look at the various features of each. You may prefer something classic like a Rock Chucker, or the innovative open-front MEC. 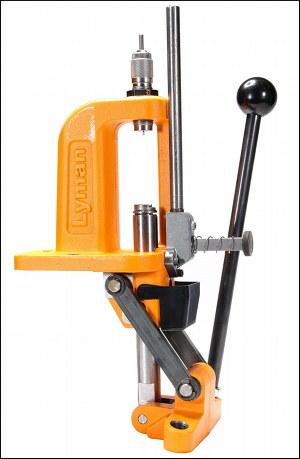 If you are looking for a compact press to use at the range, the new Lyman C-Frame is very impressive for the price. And the Forster Co-Ax remains a great addition to any loading room. If you are looking for a new, full-size single-stage reloading press, definitely consider the MEC Marksman. Created by the makers of the popular MEC shotshell reloading systems, the MEC Marksman combines a sturdy cast-iron frame with a modern open-front design. 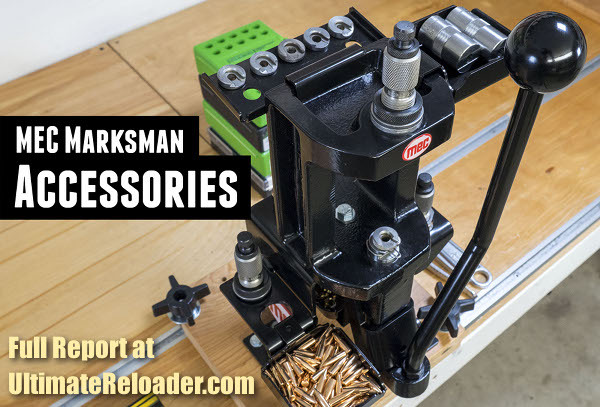 With a $189.99 street price the Marksman press cost roughly $20 more than an RCBS Rock Chucker, but the MEC offers some distinct advantages — such as an open front plus a floating shell-holder system. 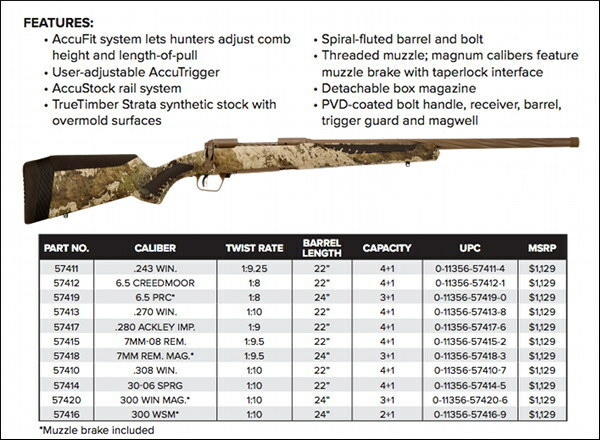 Our friend Gavin Gear of UltimateReloader.com got his hands on a MEC Marksman press and put it through its paces. He came away impressed with the product, saying it delivers excellent performance, and has many impressive features. Gavin tells us: “Cast iron tools and machines are a lifetime investment. The made-in-USA MEC Marksman features ductile cast-iron construction, an open-front frame design for easy cartridge access, a new floating shell-holder design with a unique retention system, and ambidextrous handle setup.” MEC also offers a wide selection of accessories for the Marksman press, including a press riser/mount, shell-holder caddy, and die trays. 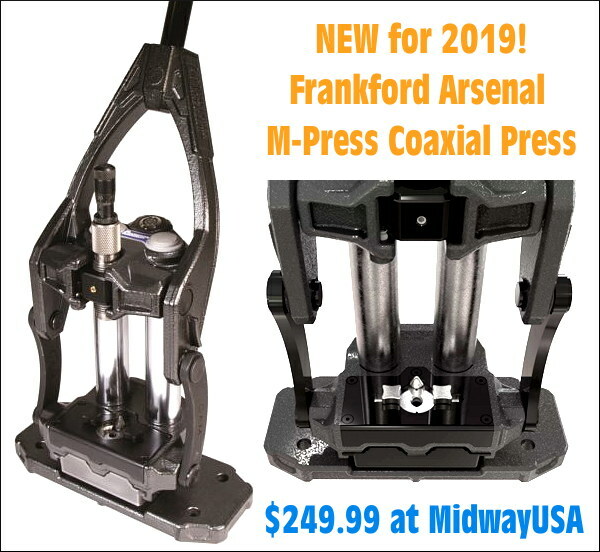 Sorry, this new Frankford Arsenal coaxial M-Press has not started shipping yet so we don’t have a video. But MidwayUSA says it should arrive by mid-February 2019. We think this new M-Press should interest Forster Co-Ax fans. While the operation is similar to the Forster Co-Ax, there are some important differences. The new M-Press mounts on a flat surface, with nothing protruding below. That is significantly different than the Forster Co-Ax. The die block is different. It also appears that the shell-holder system is different. But this still self-aligns like a Forster Co-Ax. “A free-floating design allows the die and shellplate to move on two axis, so the case is always perfectly centered in the die, minimizing bullet runout.” The way the arms move is also different. In the Forster Co-Ax, the rods slide within the press frame and the part that holds the shell is fixed to them. In this design the rods are stationary and the part that holds the shell slides on them. However, the overhead handle certainly does copy the distinctive Forster design. NOTE: According to MidwayUSA, this M-Press does NOT have priming capability, unlike the Forster Co-Ax. Credit Boyd Allen for design analysis. If you are not yet familiar with the many unique features of the Forster Co-Ax, we recommend you watch the video above, a very thorough video review by Rex Roach. This shows how the press operates and highlights the design elements which set the Co-Ax apart from every other reloading press on the market. This 14-minute video shows the key Co-Ax features, explaining how the floating case-holder jaws work (3:30 time-mark), how the dies are held in place (4:40 time-mark), how spent primers are captured (6:10 time-mark), and how to set the primer seating depth (10:00 time-mark). We’ve used a Co-Ax for years and we still learned a few new things by watching this detailed video. If you are considering purchasing a Co-Ax, definitely watch this video start to finish. In recent years, Forster Co-Ax® presses have been somewhat hard to find, as demand has out-stripped supply. The Co-Ax has many dedicated fans, given its unique features, such as the floating case-holder jaws, and easy, rapid slide-in/slide-out die placement. We’ve also found that Co-Ax presses load very straight ammo and we like the ability to switch between short handle (good for bullet seating) and long handle (ideal for heavy case-sizing tasks). We also think the Forster Co-Ax has one of the best spent primer capture systems on the market — a straight drop into a removable plastic cup. Simple and it works. Lyman’s New Victory Single-stage Press competes with the RCBS Rock Chucker Press. With beefy cast iron construction, the Victory’s strength and leverage rivals the Rock Chucker. If you like to prime on a press, this Victory has a priming system that’s much easier to use than the Rock Chucker system. The priming tube is right up front. Simply push the shuttle at the button of the tube to advance the primer into place. 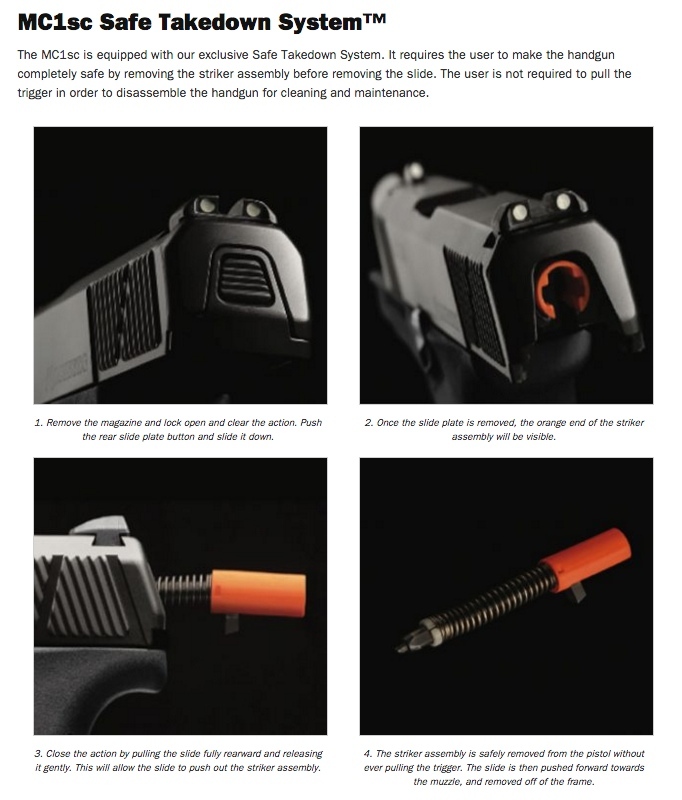 The entire primer-loading system can also be removed so it doesn’t interfere with case and bullet-handling operations. We generally prefer to prime cases separately using a dedicated hand- or bench-mounted tool, but the Victory press does the job nicely. Overall, the Victory is a great value in a full-size “O-Frame” press. It’s on sale now for $154.99 at Midsouth. 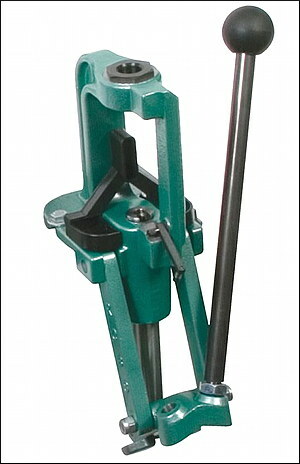 Nearly every serious hand-loader has owned or used the RCBS Rock Chucker press. This Editor still uses a Rock Chucker passed down by his brother 20 years ago. And yes, it is still going strong. The latest Rock Chucker Supreme single-stage press features an improved “upside-down Y-path” dual-bin spent primer catcher. Otherwise the Rock Chucker Supreme remains big, strong, versatile and sturdy. It has very strong linkages, with a compound leverage system providing plenty of power — FL-sizing is a breeze even with large, magnum cases. The 1″-diameter ram has 12.5 sq. inches of ram-bearing surface. Some people may not know that the Rock Chucker offers a secondary 1 1/4″ x 12 thread for shotshell reloading dies and Piggyback 3 upgrade. The Rock Chucker Supreme retails for under $180.00 ($167.50 now at Bruno’s). The RCBS Rock Chucker is definitely a quality product that can last a lifetime. For heavy-duty sizing chores this remains one of the best choices in single-stage presses. We do recommend shopping around. You can sometimes get a pretty big discount on Rock Chuckers and RCBS has regular rebate programs. 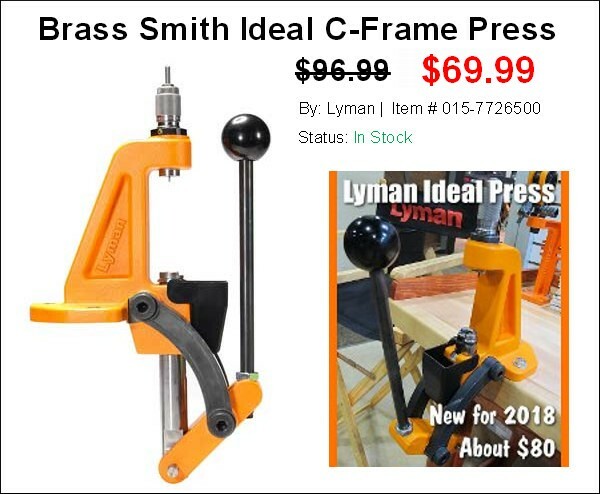 The Lyman Brass Smith Ideal Press is a very affordable, cast iron C-Frame reloading press. We think it is the new “class leader” in compact presses. This works great as a secondary press for your reloading room or a small press you can take to the range. The large front opening allows you to access the shell holder without hitting the support bar on other types of presses. 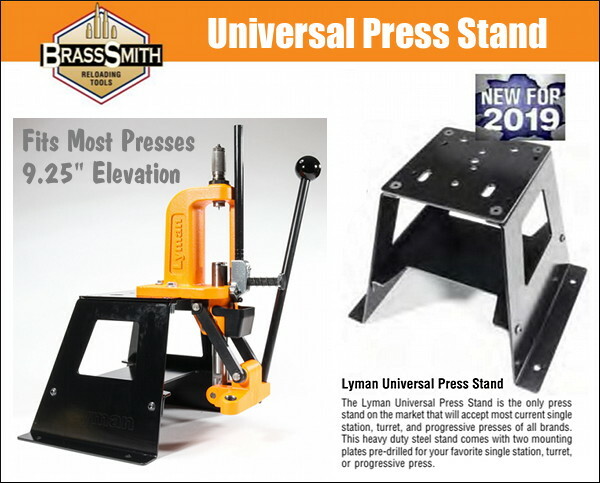 Unlike other compact presses made from aluminum, Lyman’s Ideal press is cast iron so it is rigid and strong. The high-quality steel ram is one inch in diameter. The Brass Smith is a true ambidextrous press that can be accessed from either side and mounted the same. This is a great choice for a second, auxiliary press for depriming and bullet seating. In this “Reloading with Rosie” video, the attractive female host loads some ammo using the Hornady Iron Press. With a beefy, pyramid-style cast-iron frame with an open front, this press offers some advantages over a traditional “O-Frame” type press. Access is considerably easier, for one thing. And the top of the press includes slots to hold dies and tools — that’s really a very nice feature that saves time. Also an optional “automatic” priming system shuttles primers from a vertical tube in the back to the shell-holder in the front. That’s clever. 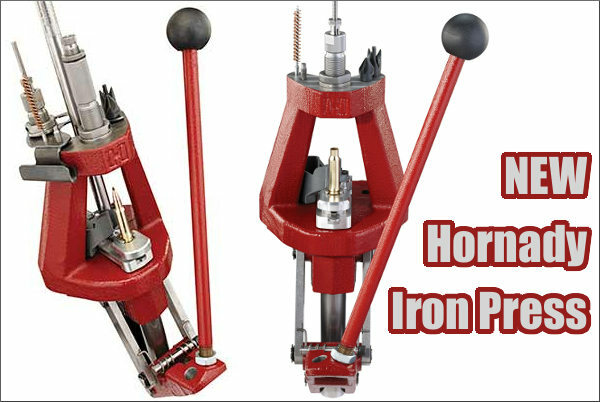 Over all the Iron Press is a nice piece of engineering — good job Hornady. 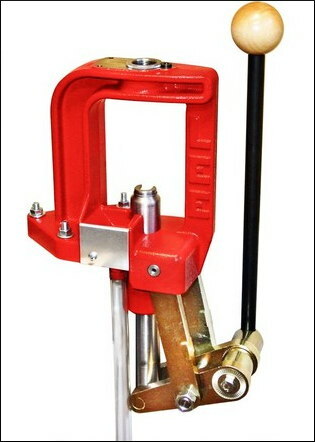 The Lee Classic Cast Breech Lock Press offers excellent value for the money ($112.00 at Midsouth). Based on the proven design of the Classic Cast press, the updated Breech Lock series adds the quick-change die bushing and an improved primer drop system. This press is strong, with cast iron frame, all-steel linkage, and 12 square inches of ram bearing surface. Lee says this press has the “largest opening and the longest stroke in the industry” among O-frame type presses. The handle can be mounted on either side. We love the fact that the handle angle can be adjusted, as well as the lever arm length — that allows you to adjust travel and leverage to suit your preference. Smart engineering. The new spent primer drop features a large-diameter hollow ram with clear hose that drops primers straight to a bin — that’s simple and effective. The press is very rigid and the base is wide enough for good stability. We have one of these Classic Cast Breech Lock Presses in our reloading room and it works well. 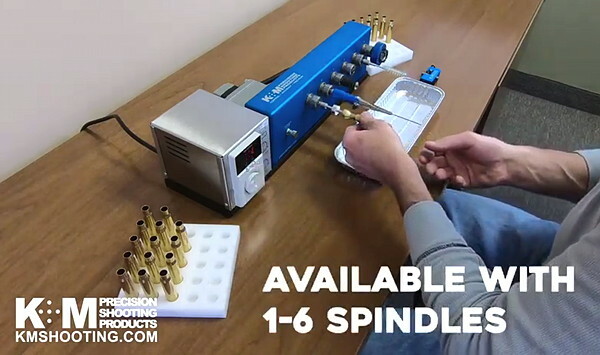 Share the post "Single-Stage Reloading Presses — Product Video Showcase"
The 6BR Improved cases have become very popular in tactical competitions. 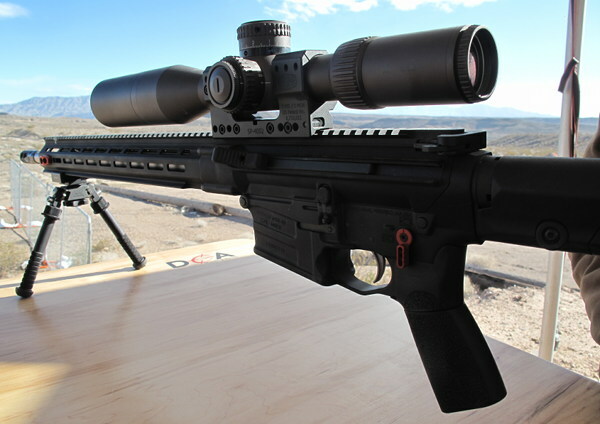 In fact the Precision Rifle Blog reports that the majority of Top 10 PRS and NRL shooters are now running some version of the 6mmBR Norma case — such as the 6mm Dasher, 6BRX, or 6BR Ackley. In fact “40% of those ranked in the top 10 in either league were running a 6mm Dasher”. This short, fat 6BR improved case can push the 100-107gr bullets to 2950+ fps, a well-known accuracy node. 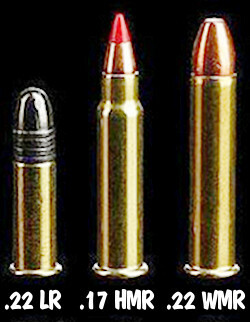 Yes the 6mm Creedmoor and 6XC can push heavy 6mm projectiles faster to be sure, but there is a trade-off in barrel life. The 6BR Improved cases represent a “sweet spot” for the tactical game, offering outstanding accuracy, with less recoil than bigger cartridges, including the 6.5 Creedmoor. The only real downside to the short/fat 6BR-based cartridges is that they can be finicky when feeding from a magazine, at least without some modifications to the follower and feed lips. There are kits that can help with this, but now there is an even better solution — a premium custom action designed specifically to feed the 6mm Dasher (and similar cartridges) from a magazine. This action, the Borden Super Short 6, was recently, unveiled on Facebook by PRS competitor John Hargett. 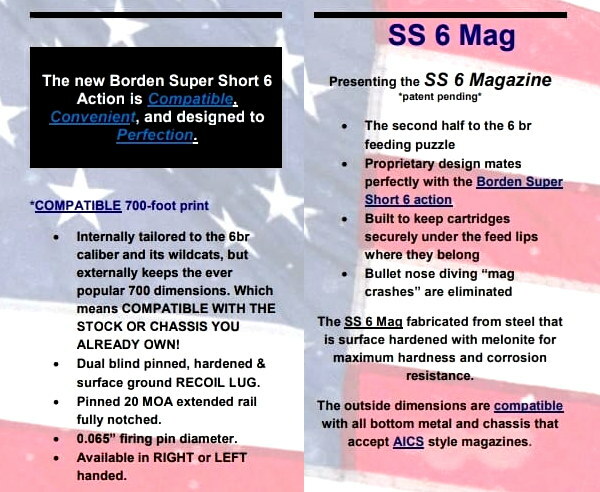 This action, available in both right- and left-hand versions, features a dedicated new Super Short 6 (SS6) magazine optimized for Dasher-sized cartridges. The bolt has a shorter throw than a standard Rem short action. We think this new action could become VERY popular with tactical shooters, and varmint hunters. 1. 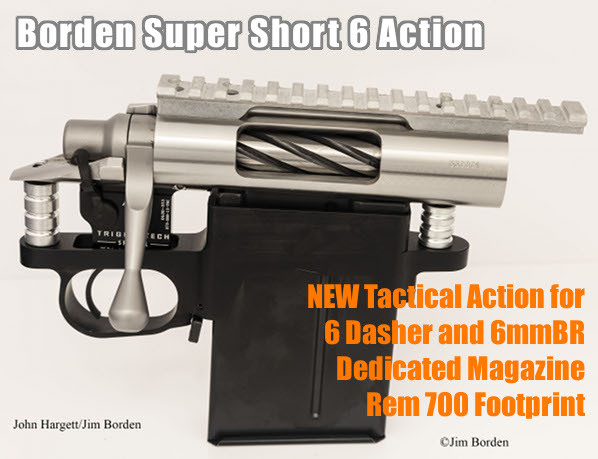 Rem 700 Footprint — The Borden Super Short 6 action is internally tailored to the 6mmBR cartridge and its wildcats, but externally maintains Rem 700 action dimensions. This means the action IS compatible with the stock and chassis you currently own. And, the Borden Super Short 6 comes in both right-hand and left-hand versions, with PVD coating available (on action and/or bolt). 2. Rem Trigger Compatibility — The Borden Super Short 6 action works with Rem-compatible triggers, and the actions are specifically timed to work with trigger of your choice. 3. 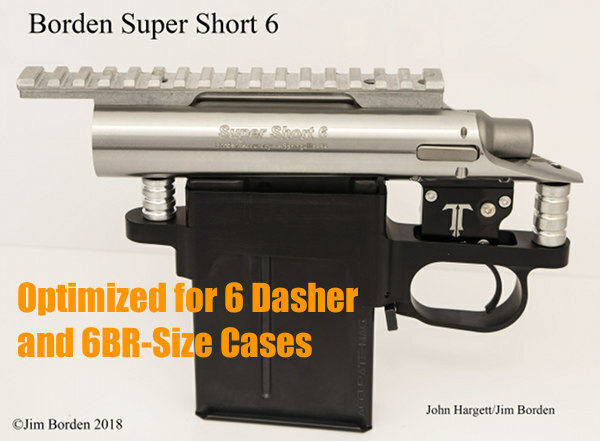 Dasher-friendly New Mag Design — The patent-pending Super Short 6 magazine is sized right for the 6mm Dasher and all the 6BR family. The follower and feed lips are configured to allow smooth, reliable feeding with no “magazine nose dives”. Even with the optimal design, the SS 6 magazine will work with all chassis profiles and bottom metal made for AICS-type magazines. 1. The vast majority of PRS Shooters surveyed are now shooting a 6mm cartridge of some kind. 3. 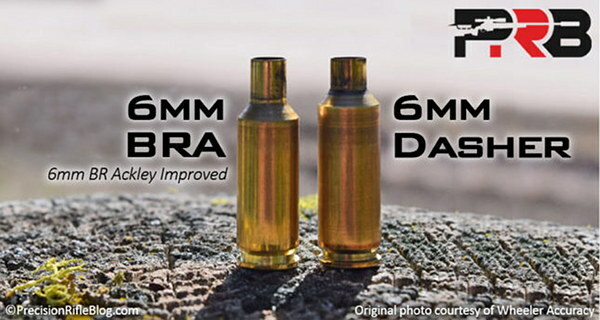 If you include the 6BRX, 6BRA, and original 6mmBR cartridge along with the 6mm Dasher, this full family of short, fat cartridges is now used by twice as many top PRS/NRL competitors as the 6mm Creedmoor. And the 6.5 Creedmoor has really fallen from favor. Credit Boyd Allen for Borden Action product find. Credit PRB for data on PRS/NRL cartridge use. Share the post "New Mag-Fed Action Optimized for 6 Dasher and 6BR Family"
Thousands of new products will be on display at SHOT Show 2019, the huge gun industry trade show held each January in Las Vegas. 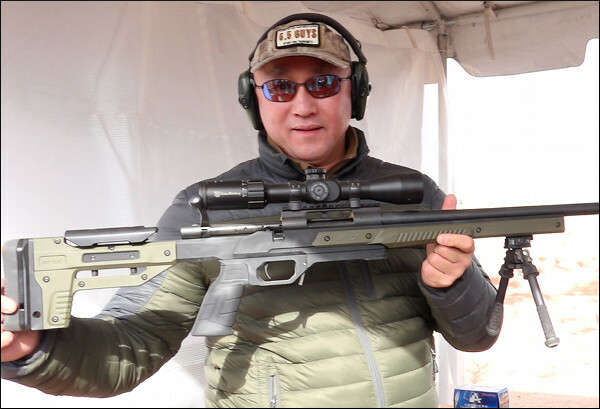 Some of the most highly-anticipated products have not yet been revealed, including new rifles, chassis systems, and state-of-the-art optics and LRFs. 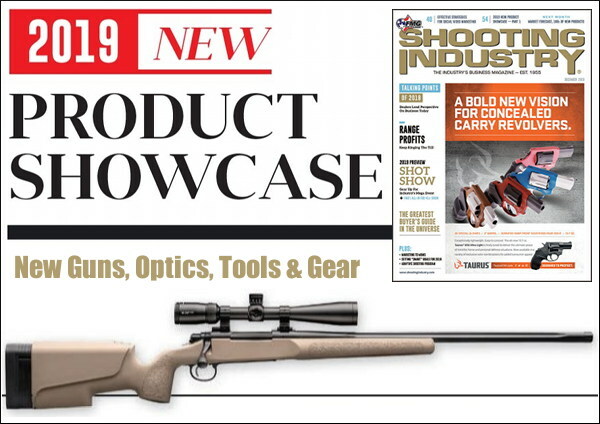 However, the SHOT Show Product Planner offers a “sneak peak” at 296 new-for-2019 products. More will come in the weeks ahead. For the time being, however, here are TEN interesting new products. Since most are completely new items, we haven’t been able to test them yet. Accordingly the product descriptions are provided by the manufacturers. 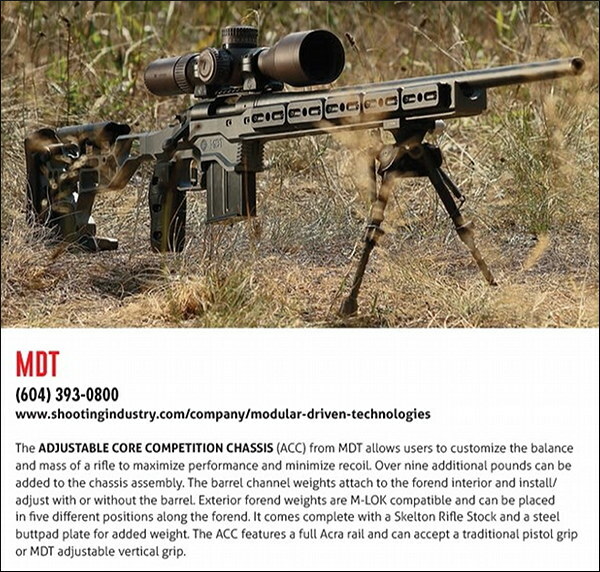 The MDT ACC (Adjustable Core Competition) Chassis was designed around an integrated, modular weight system that allows shooters to fine tune chassis weight and balance point. A series of weights (up to 9 lbs. of steel) can be added to either the buttstock, interior fore-end or exterior fore-end. With action, barrel, scope and accessories, shooters can configure their rifles upwards of 25-30 lbs. in the ACC. The ACC weight management system allows shooters to rapidly adjust the feel and recoil characteristics of their rifle — at the range or during a competition. Other features include: full 17” ARCA/RRS fore-end, flared mag well, extended barricade stop, widened thumb shelf, and adjustable cheek riser/length of pull. 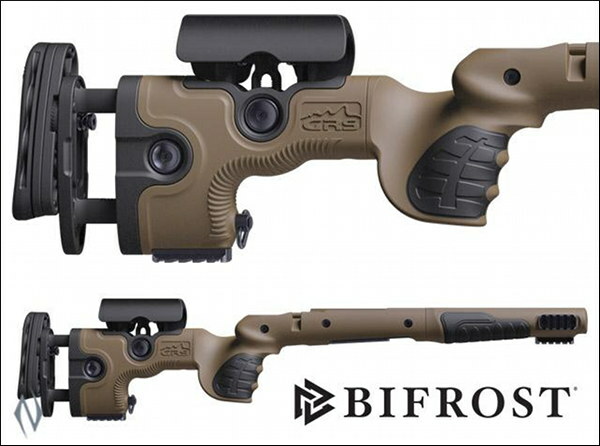 The new GRS Bifrost stock is made of glass fiber-reinforced composite material with tactile rubber surfaces on the grip and fore-end zones. The SpeedLock 2.0 system has LOP and Cheekpiece adjustment, like the original Speedlock system, but also includes a height-adjustable and cant-adjustable recoil pad. This allows for the perfect stock to shooter fit. Picatinny Rail mounts are located on the bottom and both sides of the fore-end, and the bottom of the buttstock. 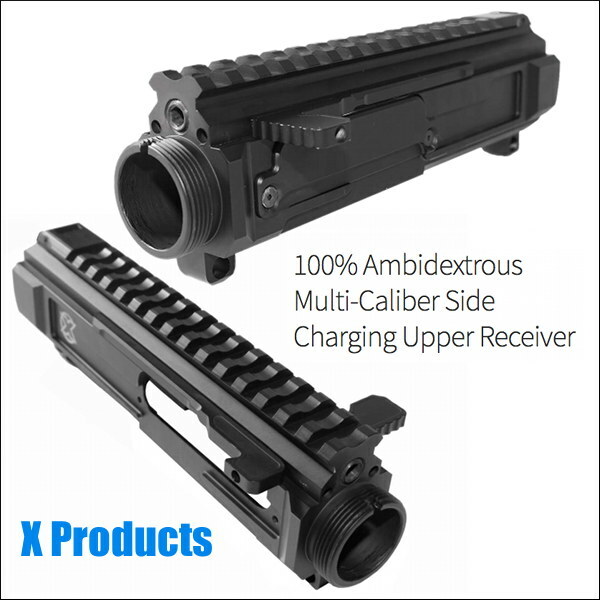 This allows easy attachment of lights, lasers, monopods, and bipods. Two Picatinny rails are included with the Bifrost stock, which retails for $730.00, as inletted for a variety of popular actions. 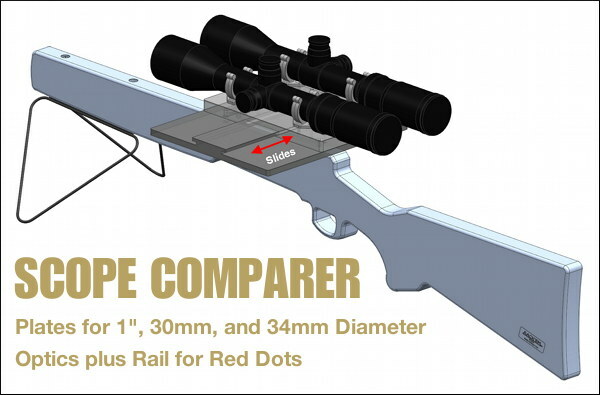 This innovative Scope Comparer allows consumers to compare rifle scopes side-by-side. 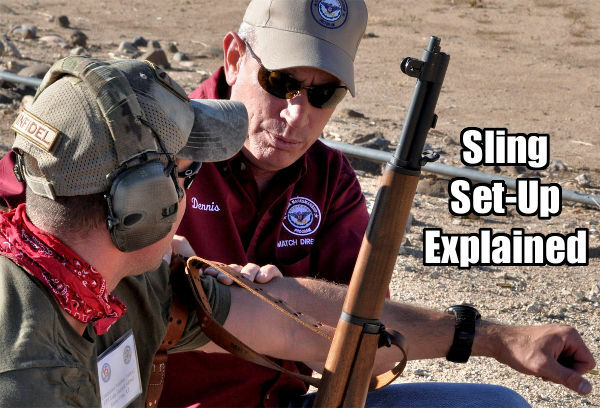 Simply slide the plate laterally to compare rifle scopes. This system ships with three different plates — One Plate for 30mm tube scopes, one for 1″ tube scopes, and a third (with rail) for red dot-type optics. An optional plate for 34mm-tube scopes is also available. All the sliding plates easily remove with the pull of a pin. Made by Rack ‘Em Racks, the novel Scope Comparer retails for $199.00. The WiFi-enabled RS500i is Vaultek’s newest and largest safe. 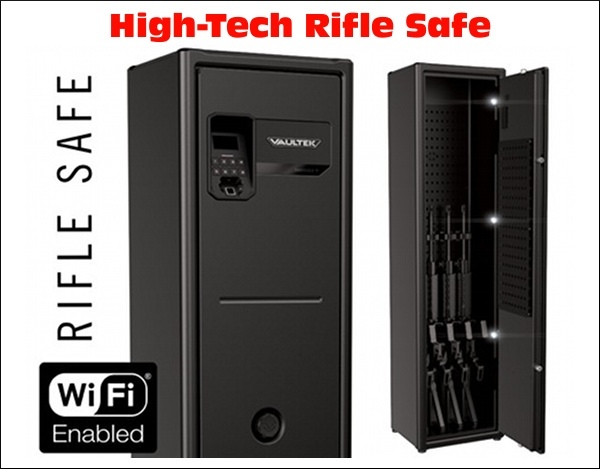 Holding up to 4 four full-size rifles, this high-tech safe features full WiFi connectivity, providing quick access via oversized biometric scanner, Smart Key, backlit keypad, and standard backup keys. With WiFi connectivity you have complete remote management and live push notifications. With the all-new online dashboard or your smartphone you can securely monitor critical safe data from anywhere. A variety of modular accessories allow full customization of the LED-lit safe interior for magazines, handguns, and barrel mounts for rifles. Learn more at Vaulteksafe.com. Kalispel Caseline aluminum rifle cases are made in the USA from .080 marine-grade aluminum. They feature closed waterproof rivets, military spec hardware and stainless steel locking rod assemblies. 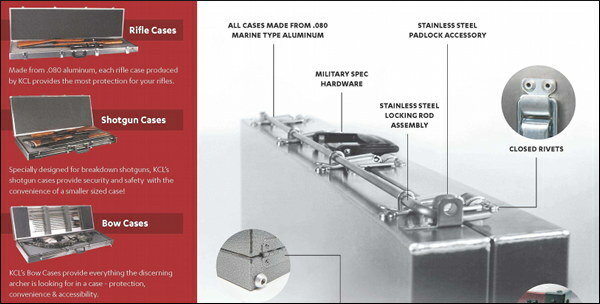 These metal cases features Heliarc welds for strength and security, not fused joints like other lesser brands. Each case is hand-inspected for quality control. Kalispel has been making cases for many years, but there are new models for 2019. Powder coating and color options available. Prices range from $160 to $550. CREDIT EdLongRange for locating the 2019 New Product Showcase website. 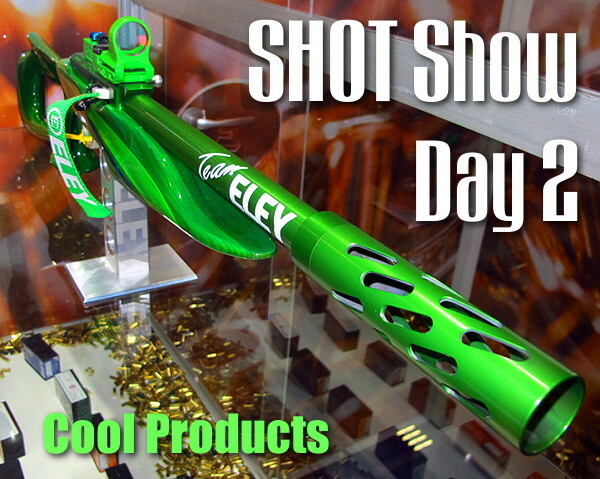 Share the post "New Product Showcase for SHOT Show 2019"
Christmas is nearly here, so today we’re featuring a hand-picked collection of “stocking stuffers” for precision shooters. Some of these are recent new inventions. All are handy items that you’ll use over and over again at the range, on your vehicle, and/or at your loading bench (so you’re allowed to buy them for yourself, even after Christmas). 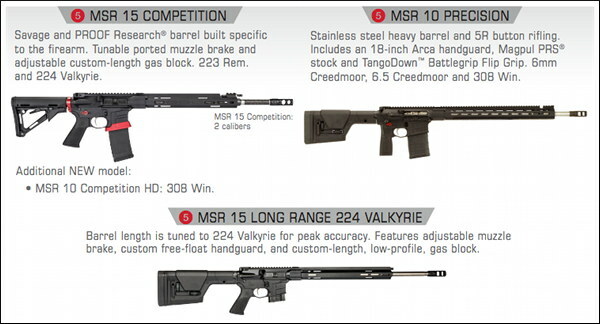 Here are three handy items from Creedmoor Sports. The red Empty Chamber Indicator is a “must-have” for every competitor shooter. And black rifle fans can use the special combo Open Bolt Indicator/Safety Flag that fits in an AR’s dust cover. The AR-15 Magazine Block adds ad extra measure of safety. 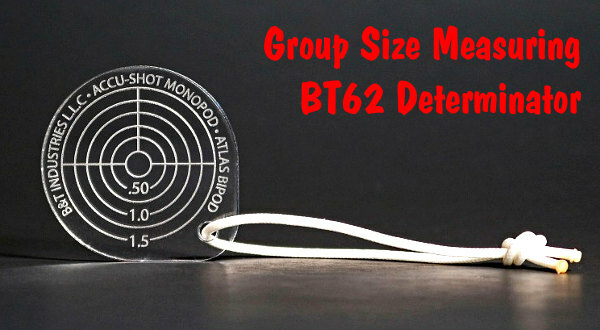 The acrylic BT62 Determinator measures groups with laser-cut concentric measuring rings. Check group size quick and easy — simply place the Determinator over shot group. Adjust until one of the circles crosses the center of the two outer-most holes. That gives you the center to center group measurement (1.5″ maximum). Alternatively, you can measure edge to edge (of the farthest shots) and then subtract the bullet diameter. Cool tool for gun guys. The supplied lanyard also glows in the dark. 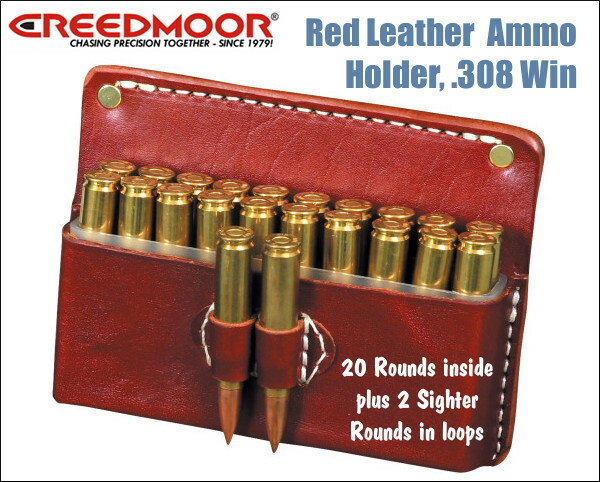 This handsome red leather ammo holder secures twenty (20) rounds of .308 Win-size ammunition, in a handy plastic carrier. In addition there are loops for 2 more sighter rounds on the outside. 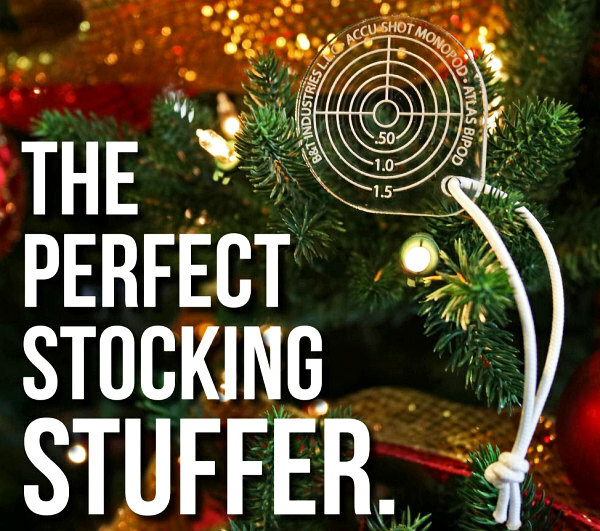 This is a very nice gift for a target shooter or hunter. There is also a .223 Rem version in black leather. Both these leather ammo holders conveniently fit into a shooting coat pocket via a leather pocket flap. Always watch the wind when you shoot. 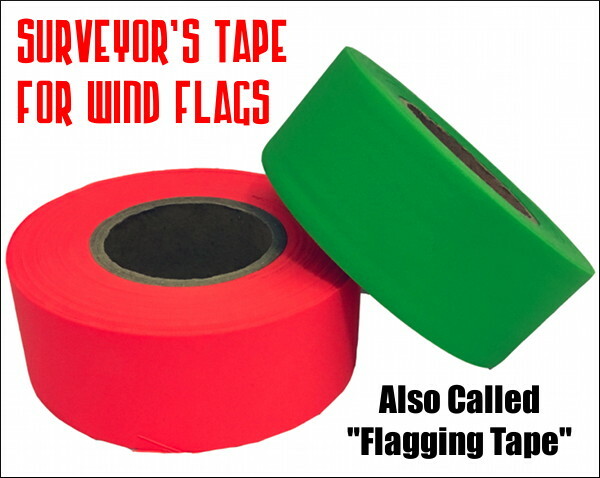 Inexpensive, Day-Glo Surveyors’ Tape (aka “Flagging Tape”), attached to a stake or target frame, makes a good wind indicator. It will flutter even in mild breezes, alerting you to both angle and velocity shifts. This should be part of every range kit. Don’t leave home without it. This can also be ordered from Creedmoor Sports for $3.99 per roll. 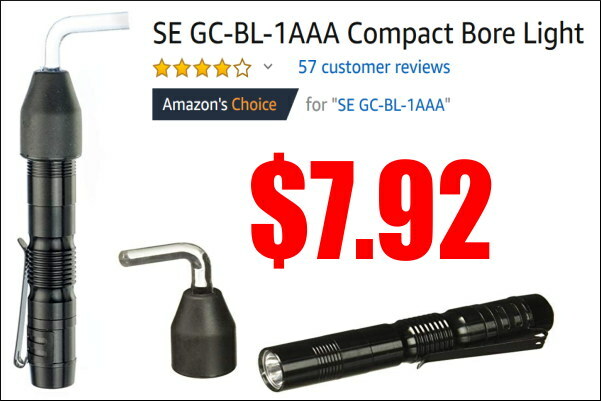 You won’t find a more versatile tool at this amazingly low price — just $5.99! 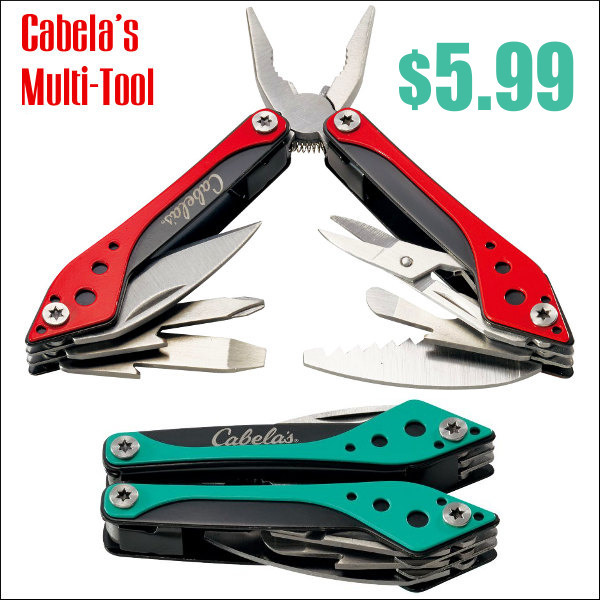 The Cabela’s multi-tool performs many functions. It features flat-nose pliers, wire-stripper, knife, Phillips and flat-head screwdrivers, saw, bottle opener, and scissors. Nylon sheath included. This handy tool is available in size colors: Red, Green, Orange, Purple, Teal, and Silver. A nylon sheath is included. Here’s a very clever use of fired pistol brass. A female-threaded insert in the brass cases matches the threads on your automotive valve stems. So these Brass Stem Caps fit right in place. Way cooler than plastic stem caps — these definitely send a subtle but meaningful message. 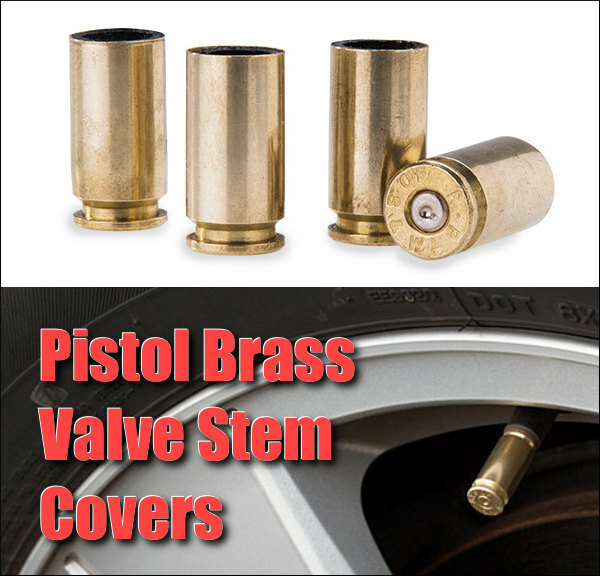 The $9.95 set comes with four (4) .40 SW caliber, once-fired valve stem caps. 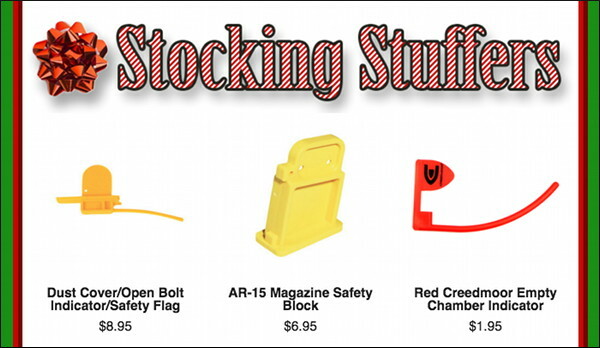 Don’t have a stocking to hold your small gift items? Well we’ve got you covered — check out these cool, heavy-duty stockings. These Garud Tactical Stockings come in four colors: Camo, OD Green, Black, and Khaki. They all feature 4 MOLLE attachments, rugged carry handle, hanging hook, swivel carabiners, outside draw pocket, and even Velcro USA Flag Patch. Get all this for the low price of $12.99 (black) or $13.99 (other colors). 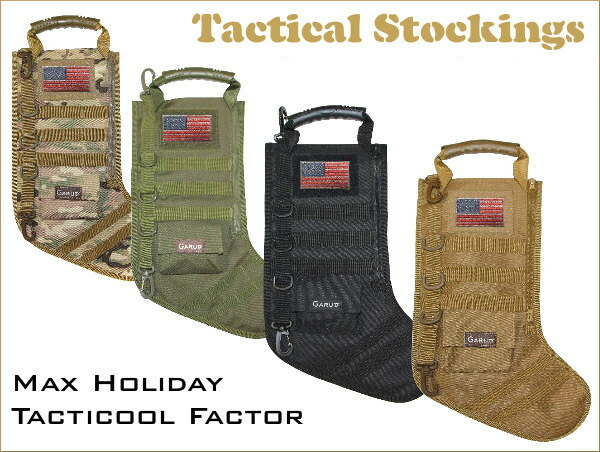 These stockings are sure to bring smiles to your tacticool family members and friends. And right now they ship for FREE on Amazon. Credit EdLongrange for BT62 Determinator suggestion. 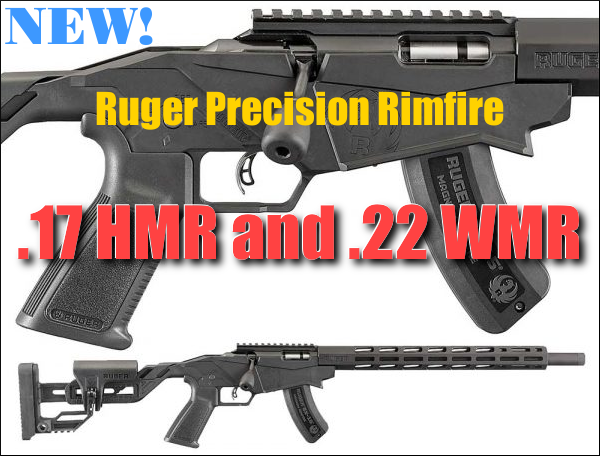 Share the post "Stocking Stuffers for Serious Shooters"
The popular Ruger Precision Rimfire rifle is now available in two additional rimfire chamberings: .17 HMR and .22 WMR. This makes the rig more suitable for use in varminting. Both cartridge types, .17 HMR and .22 WMR, also offer higher velocities, less wind drift, and flatter trajectory than the .22 LR. This is a benefit when cross-training. You can shoot at more distant targets with considerably less elevation dialed in your scope. And the windage corrections will be less extreme. We really like the .17 HMR — it’s our favorite rimfire cartridge for small varmints out to 160 yards. Like its .22 LR version, the magnum Ruger Precision Rimfire models featured an adjustable bolt throw (that can emulate a centerfire action if desired), along with trigger that adjusts from 2.25 to 5 pounds. The .17 HMR and .22 WMR models ship with a 0 MOA Picatinny rail and one, 15-round BX-15 Magnum magazine or one, 9-round JMX-1 rotary magazine. The BX-15 Magnum is a natural pairing for the new Ruger Precision Rimfire in magnum calibers. It is also compatible with Ruger 77/17®, Ruger 77/22® and Ruger American® Rimfire rifles chambered in .17 HMR and .22 WMR. 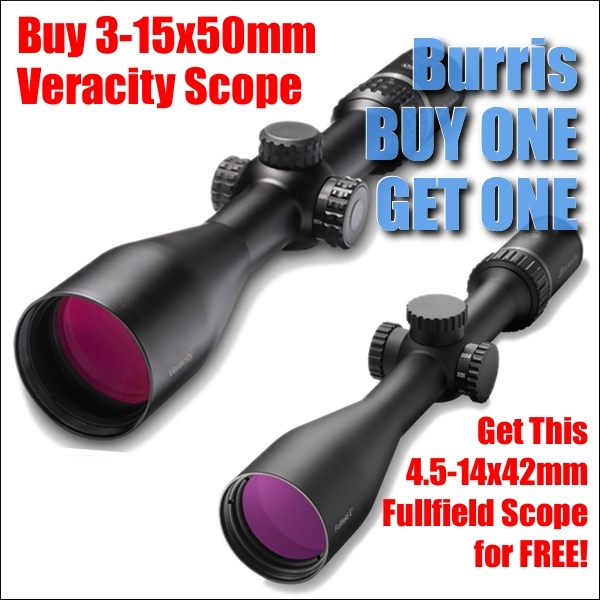 Share the post "NEW — .17 HMR and .22 WMR Ruger Precision Rimfire Rifles"
If you buy a Burris 3-15x50mm Veracity scope this month, you will get a 4.5-14x50mm Burris Fullfield Scope for FREE — a $379.00 Value. The Front Focal Plane Veracity is Burris’s top-of-the-line hunting scope featuring 5x zoom, wide field-of-view, zero stop, and Burris Forever warranty. Those who purchase a 3-15x50mm Veracity by December 31, 2018 will receive a free Fullfield E1 4.5-14x42mm Long Range MOA reticle scope, a $379 value. The Veracity/Fullfield E1 offer is available in a special bundle package at participating Burris retailers. The Veracity is a good FFP scope that PRS competitors and hunters should consider. The Veracity line earned both the Editors Choice and Great Buy awards in Outdoor Life Magazine’s 2016 Optics Test. These Veracity scopes also feature excellent Ballistic Plex reticles that feature vertical hold-over hash marks plus “Christmas Tree”-type windage holds. The Burris Eliminator III is an advanced electro-optical device that combines magnified optics with a built-in laser rangefinder and micro-processor. With the push of a button the Eliminator III ranges your target. Then the micro-processor “brain” instantly calculates the required holdover for that distance, and displays a red dot on the reticle. Simply put the red dot on the center of your target and pull the trigger. 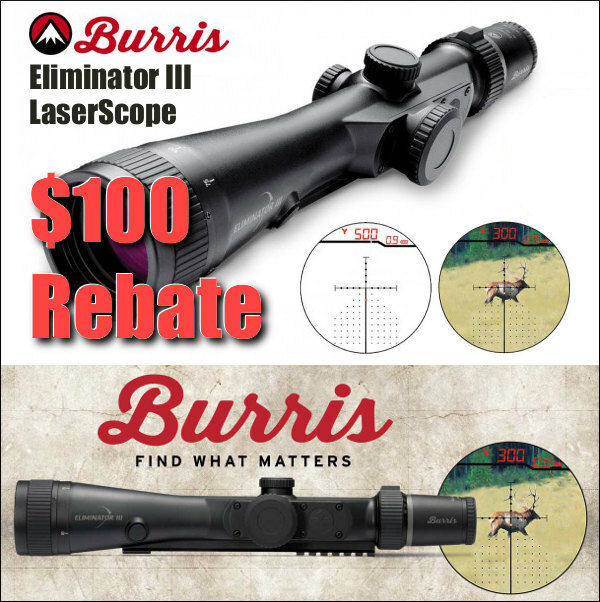 Now through December 31, 2018 you can save $100.00 on the purchase of the 4-16x50mm Burris Eliminator III LaserScope. That’s a significant savings on a proven product. We think this LaserScope is particularly handy for varmint hunters working a large prairie dog field, with critters near and far, at ranges from 100 out to 800 yards. 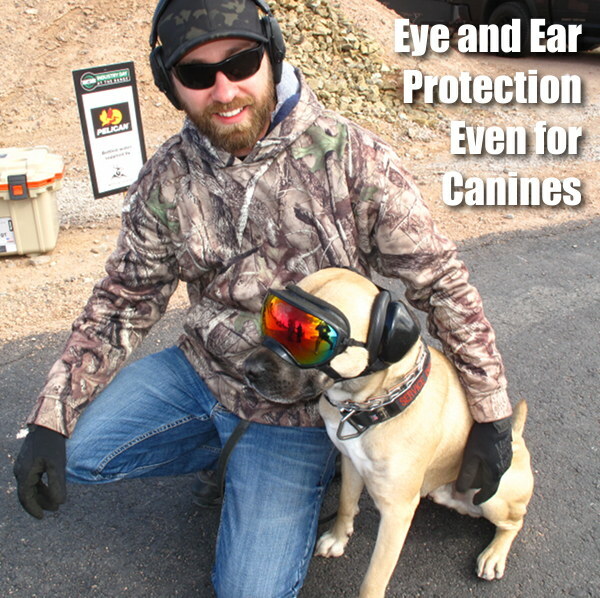 With the Eliminator, you can range a P-Dog mound instantly, then just place the red dot on the animal and you’re good. No fussing with drop charts or scope clicks. For more information on these promotions, visit: Burris Optics Promotions Page. Share the post "Burris BOGO — Buy One Get One + $100 Off Burris Eliminator"
Share the post "New Products for 2019 in Shooting Industry Magazine"
RCBS has announced the successor to the venerable RCBS Trim Mate. The New-for-2018 RCBS Brass Boss features six rotating stations that handle all your brass neck-brushing, chamfering, deburring, and pocket uniforming chores. 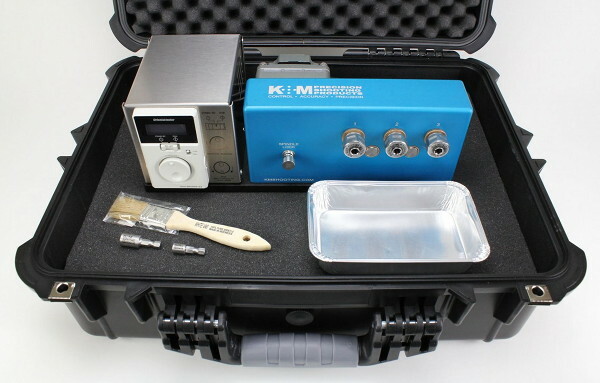 The new Brass Boss includes tools for all six stations: inside VLD chamfering tool, outside deburring tool, primer pocket cleaners (small/large), military crimp removers (small/large), primer pocket uniformers (small/large), case neck brushes (four diameters), and a tub of dry case neck lubricant. 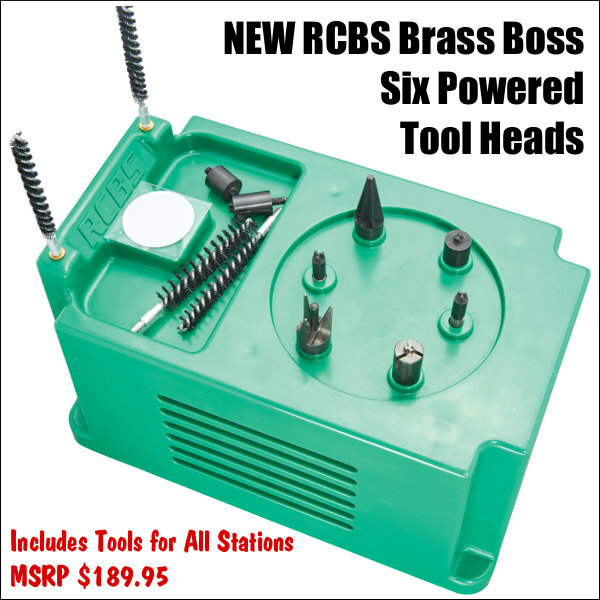 MSRP for the Brass Boss, RCBS SKU 90390, is $189.95. Current “street price” is around $157.00. This machine has two different rotation speeds for the toolheads. Four stations run at 350 rpm, while the two other stations run 57% faster, at 550 rpm. That give you a choice of spin speeds. You can work fast for tougher chores like military crimp removal, and slow down for inside-neck chamfering, which should be done carefully. Larger and taller than the older RCBS Trim Mate, the new Brass Boss has one more station (six vs. five), plus a more powerful motor. 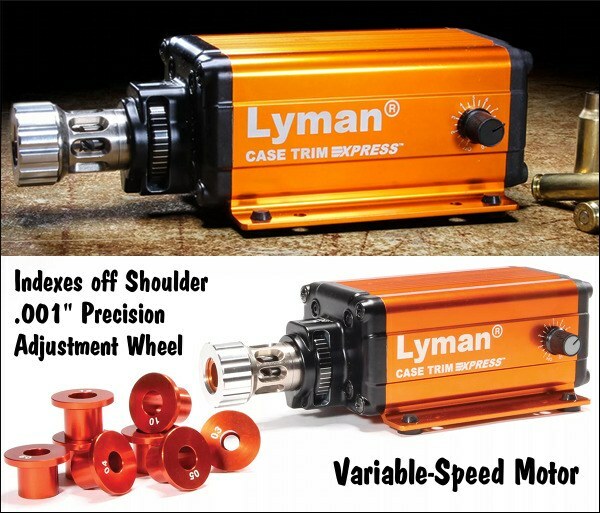 This should make the Brass Boxx more competitive with the popular Lyman Case Prep Express. 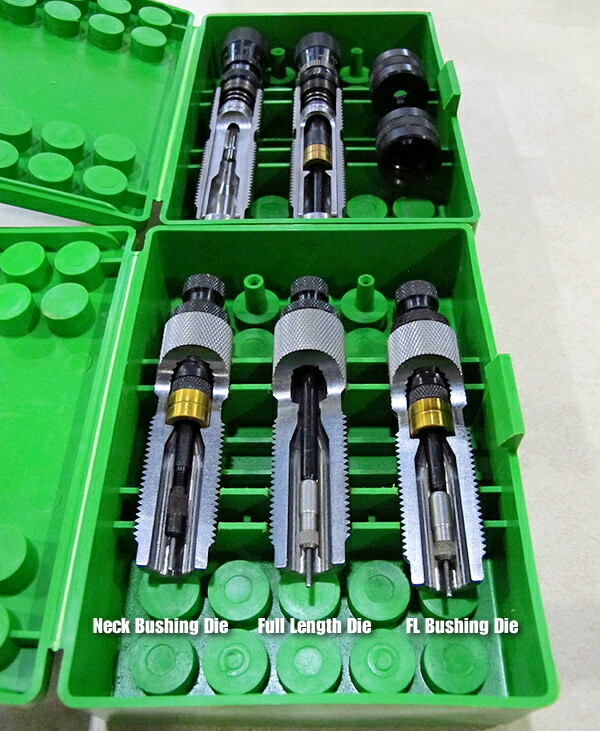 Share the post "RCBS Case Prep Station with Six Powered Tool Drives"